Castle Sween. View of South-West section. Castle Sween, interior. View across court from West. Castle Sween, interior. 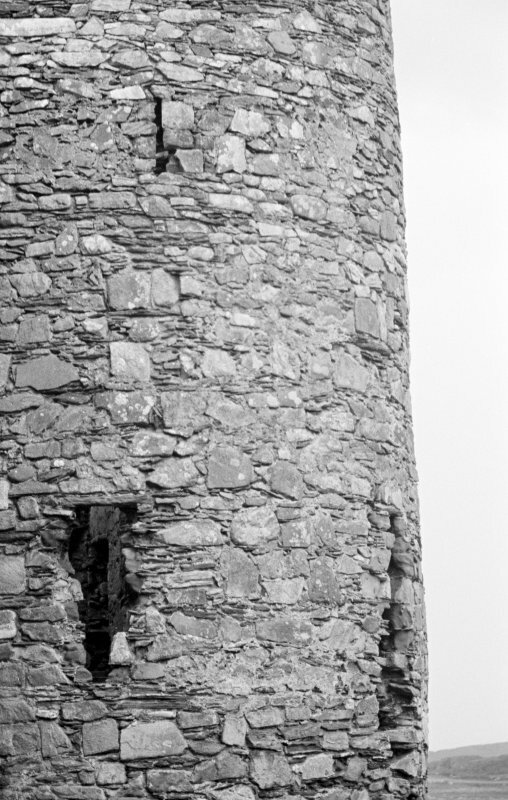 General view of shoot at base of round tower. Castle Sween. View of entrance to South corner. Castle Sween, interior. 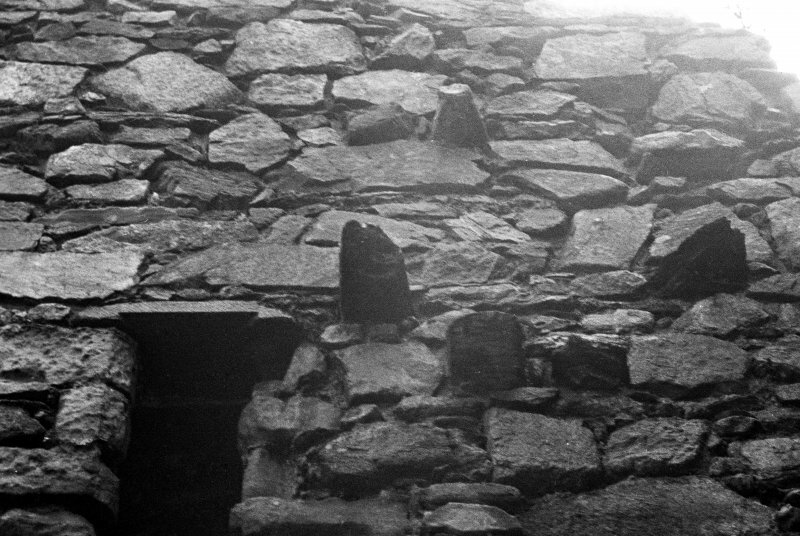 Detail of oven, flue and fireplace corbels in North Extension. Castle Sween. General view from South-East. Publication drawing. 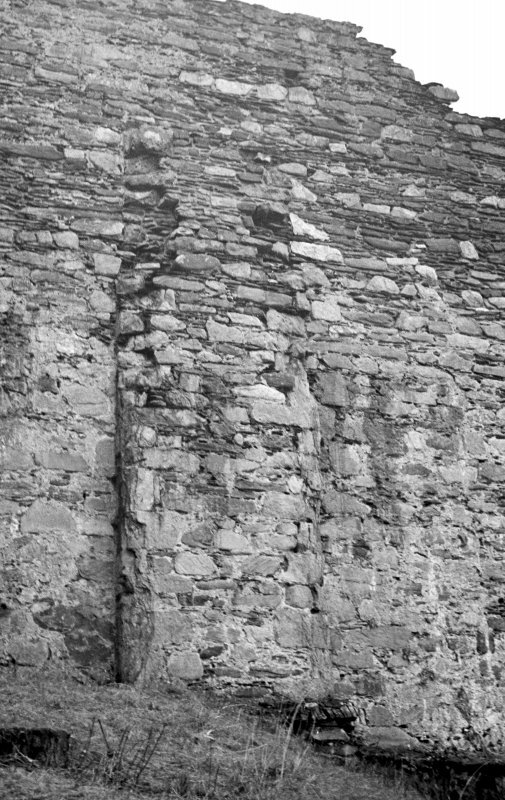 Castle Sween; sections. Castle Sween. 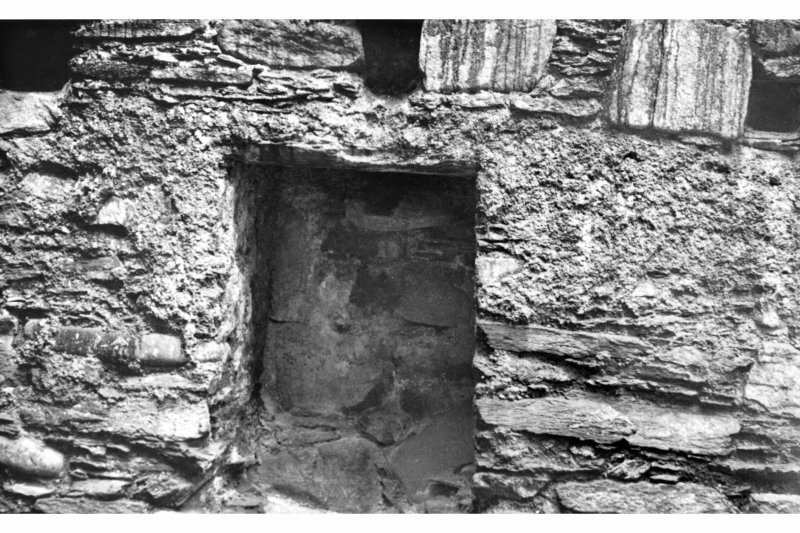 Detail of sill of window in East wall at ground floor level of Kitchen tower. Castle Sween, interior. View of window looking into North extension. 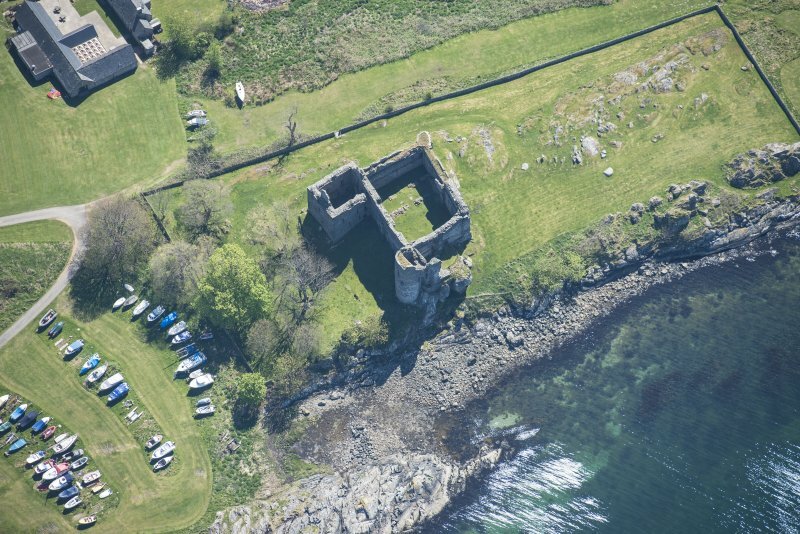 Dunstaffnage Castle. 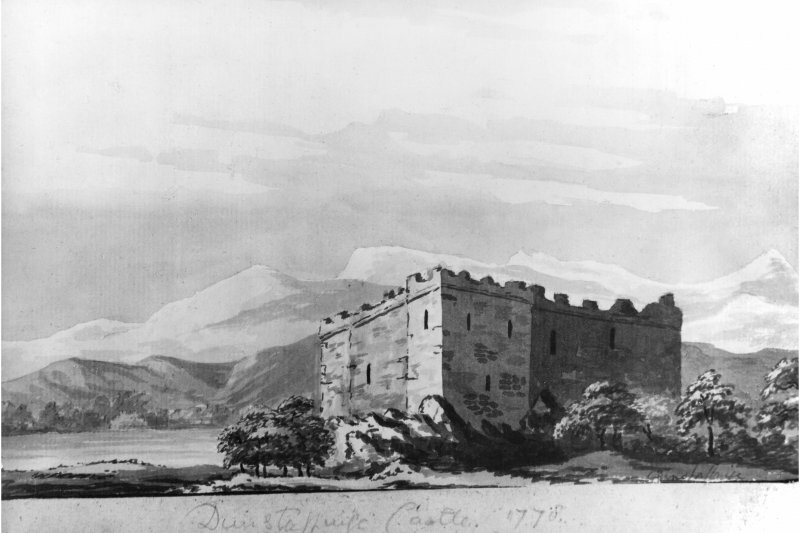 Photograph of drawing of either Dunstaffnage Castle or maybe Castle Sween. Insc. 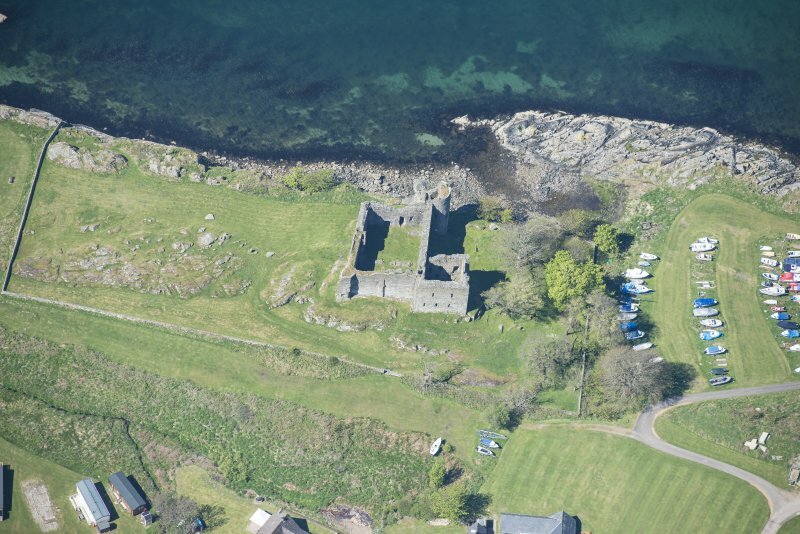 'Dunstaffnage Castle. 1778'. Castle Sween. General view of North-West platform in North wall from North wall-walk. 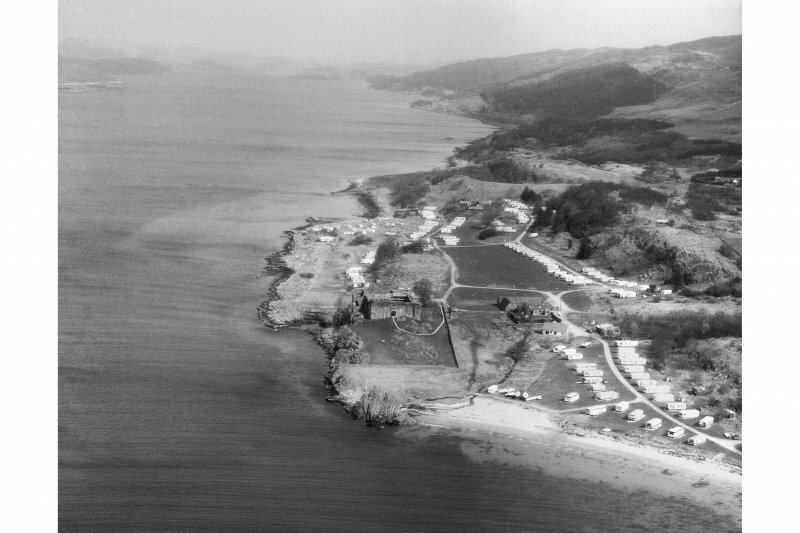 Oblique aerial view of Loch Sween. Castle Sween. View of North extension from West. Castle Sween, interior. View of courtyard. Castle Sween. General view from East. Castle Sween. 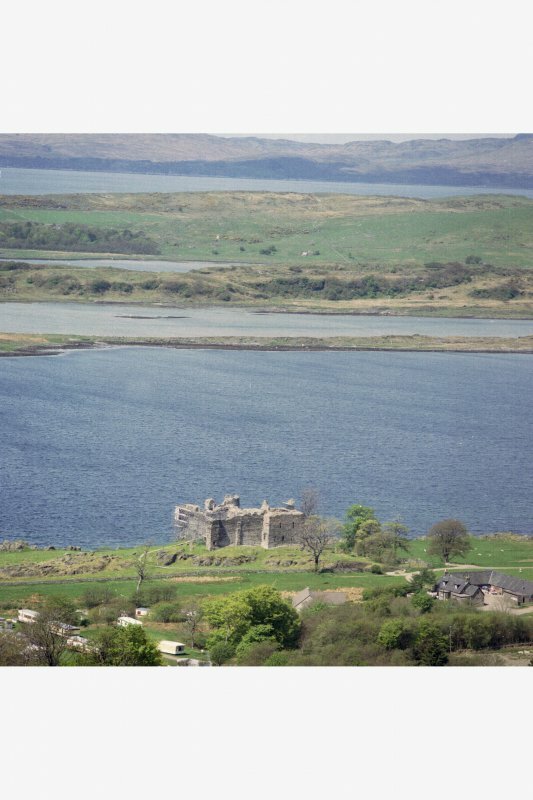 General view of Castle Sween and the loch from the South-East. Castle Sween. 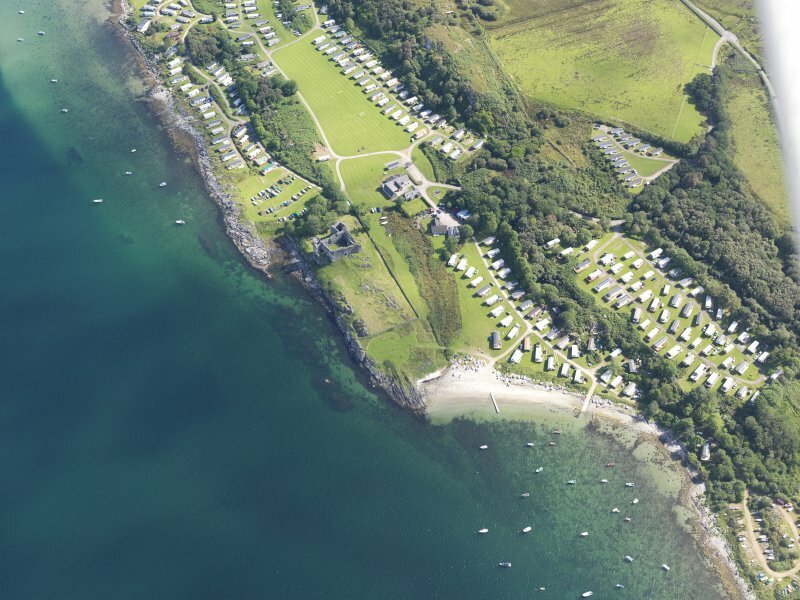 Aerial view from South-West. Castle Sween. 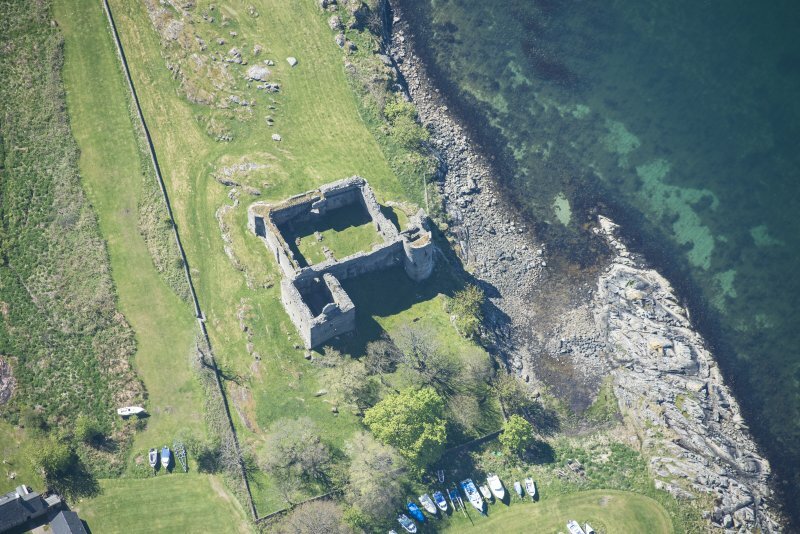 Aerial view from the North-East..
Castle Sween. 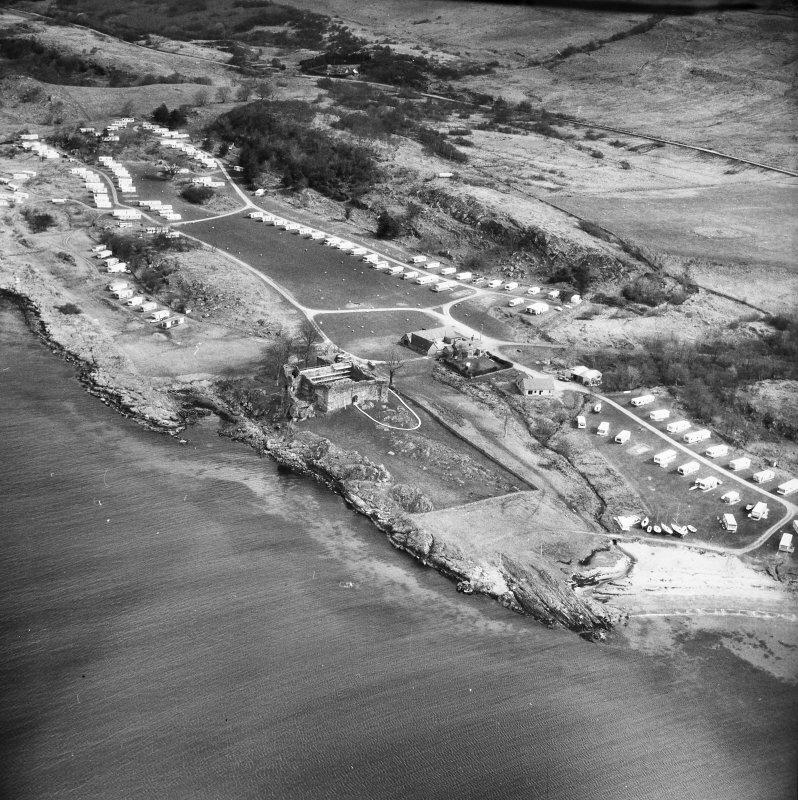 Aerial view from West. 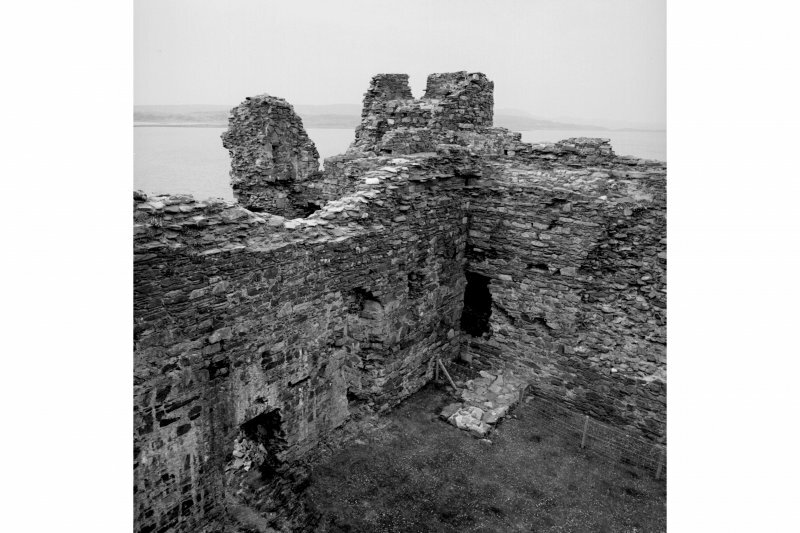 Castle Sween, interior. 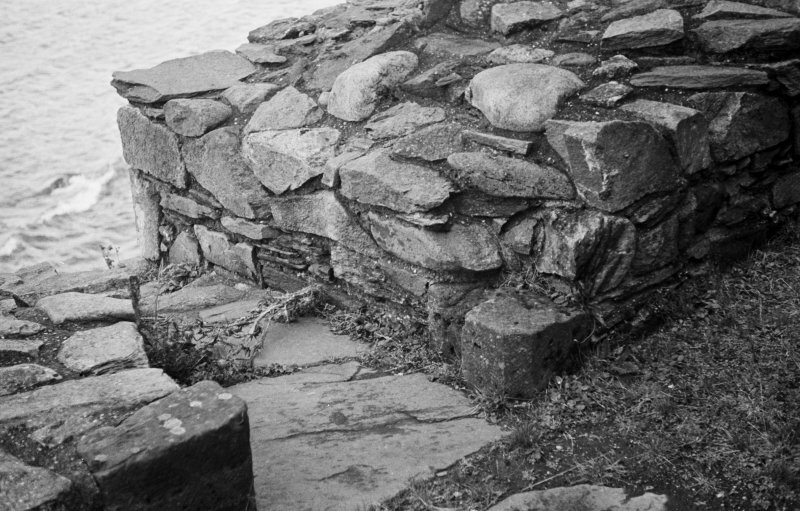 Detail of foundations on North-West side under pilaster. Castle Sween, interior. 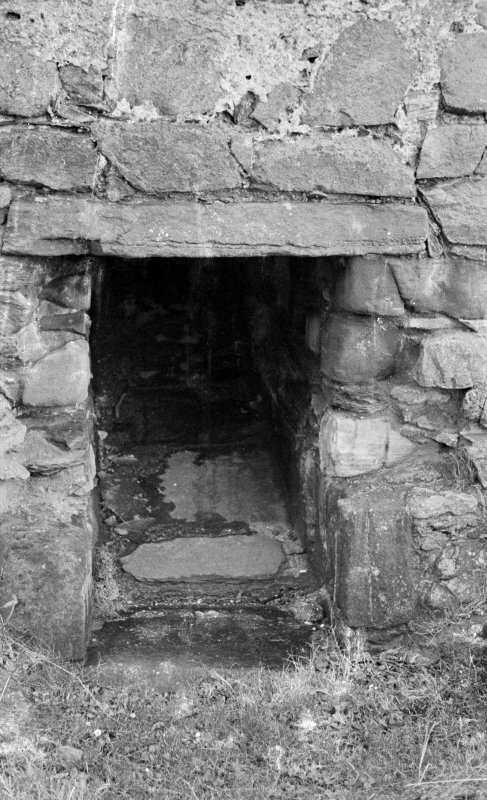 Detail of head of door leading North-West out of court. Castle Sween. View of East tower from North-West. 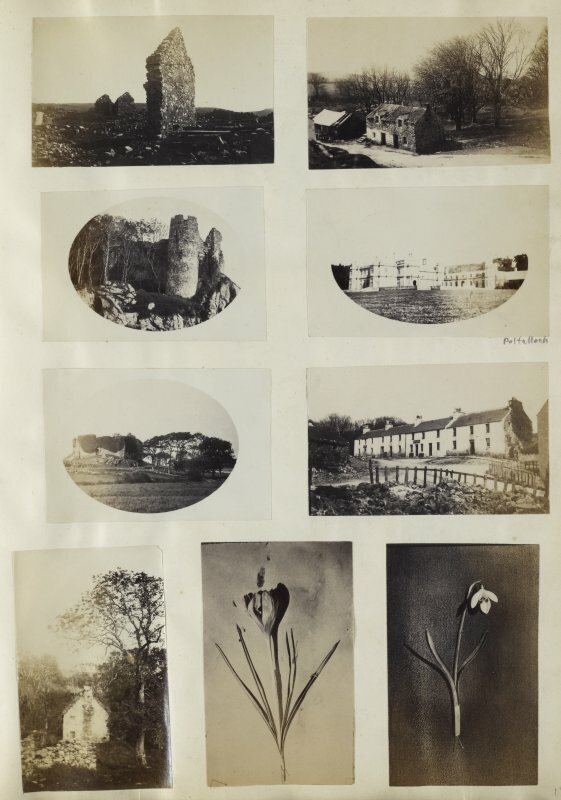 View of nine small photographs variously identified. 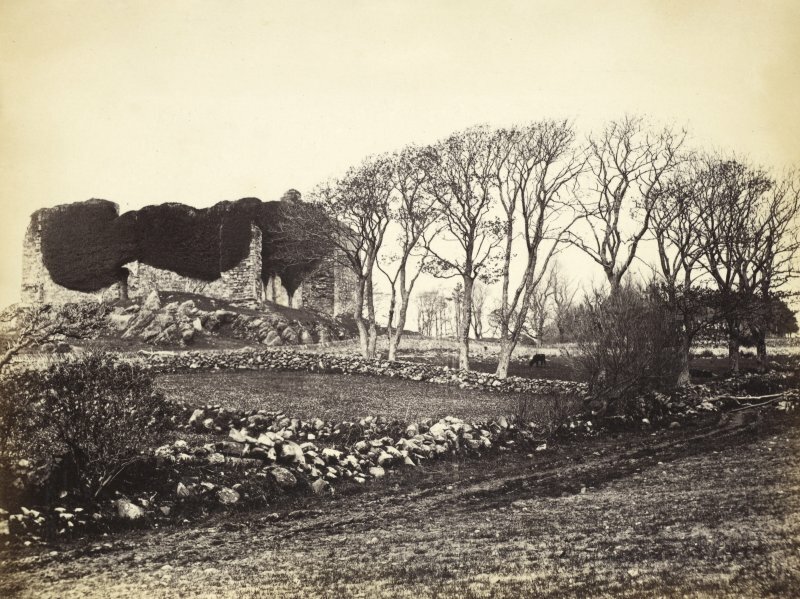 The top two images are both unidentified and are an image of a ruined building, left, and a small cottage or farm, right. The upper-central two images are both identified. 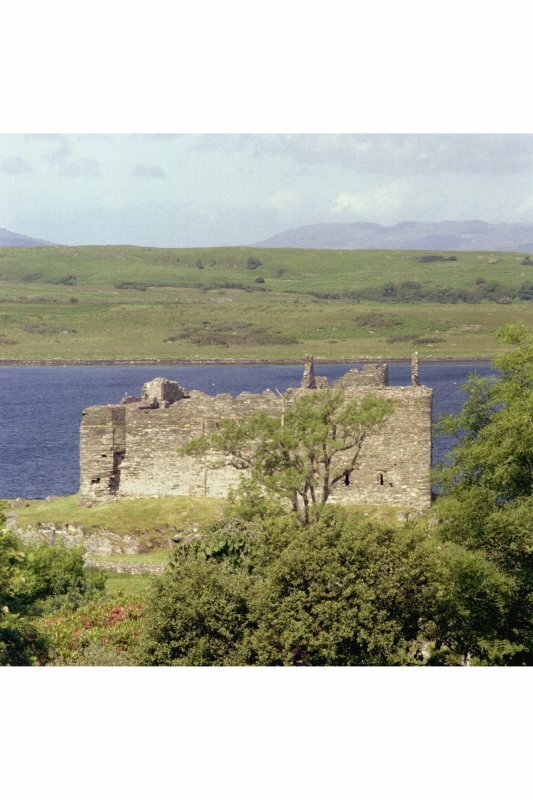 The left image is of the ruins of Castle Sween and the surrounding cliff face in North Knapdale. 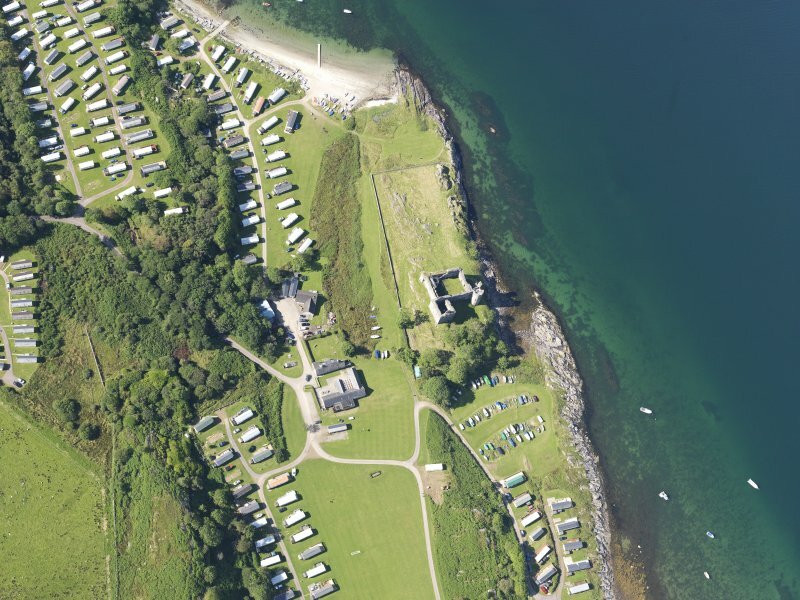 The right image is of the back and gardens of Poltalloch country house, Kilmartin. The lower-central two images and variously identified. 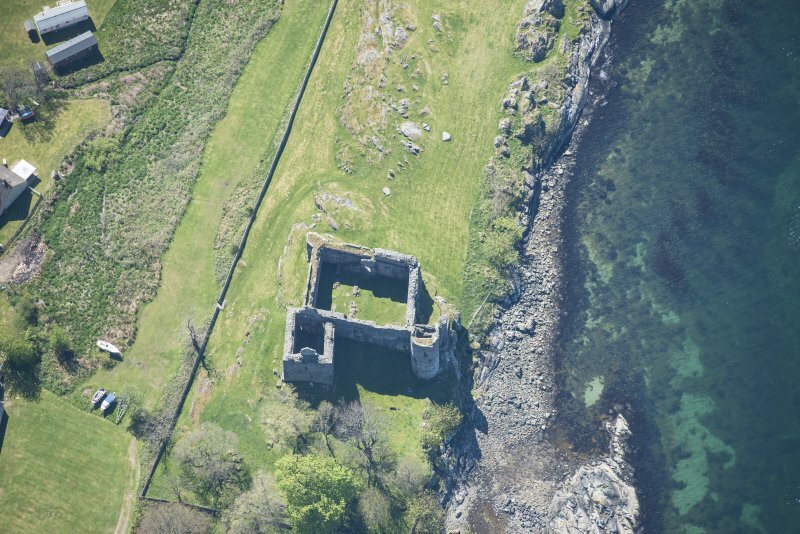 The left image is again a wider view of the ruins of Castle Sween and landscape surroundings in North Knapdale. 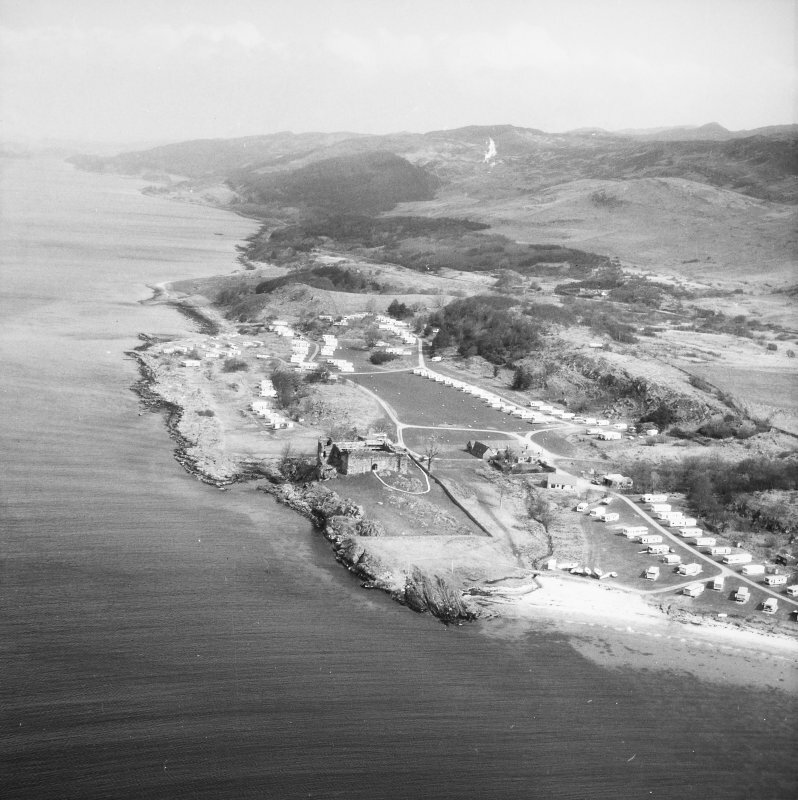 The right image is an unidentified building, possible a lodge. The lower three images are unidentified. The left image is of the side of a cottage and the central and right image are portraits of flowers. PHOTOGRAPH ALBUM No. 187, (cf PAs 186 and 188) Rev. J.B. MacKenzie of Colonsay Albums,1870, vol.2. 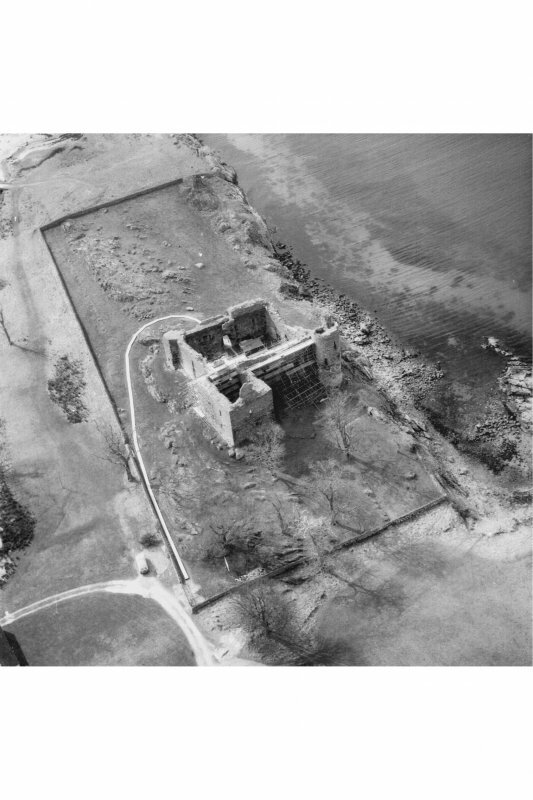 Oblique aerial view of Castle Sween, taken from the WSW. Castle Sween. 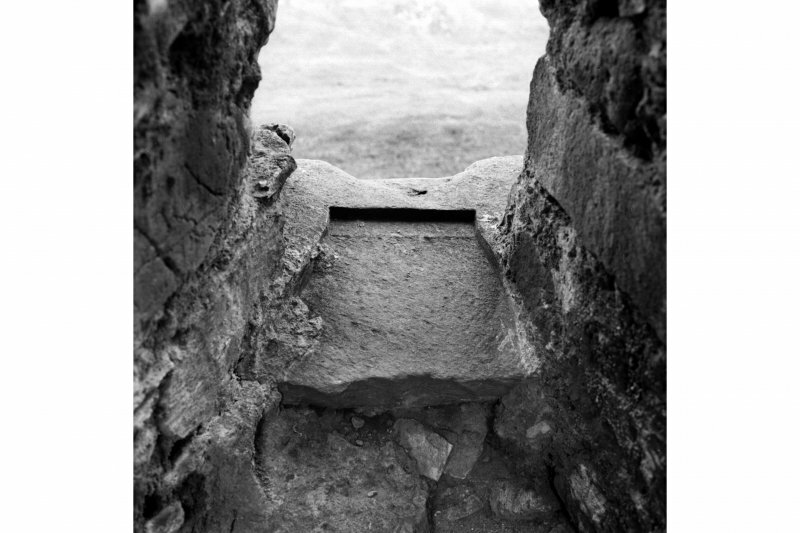 Detail of base of wall. Castle Sween. View of round tower from North-East. Publication drawing. 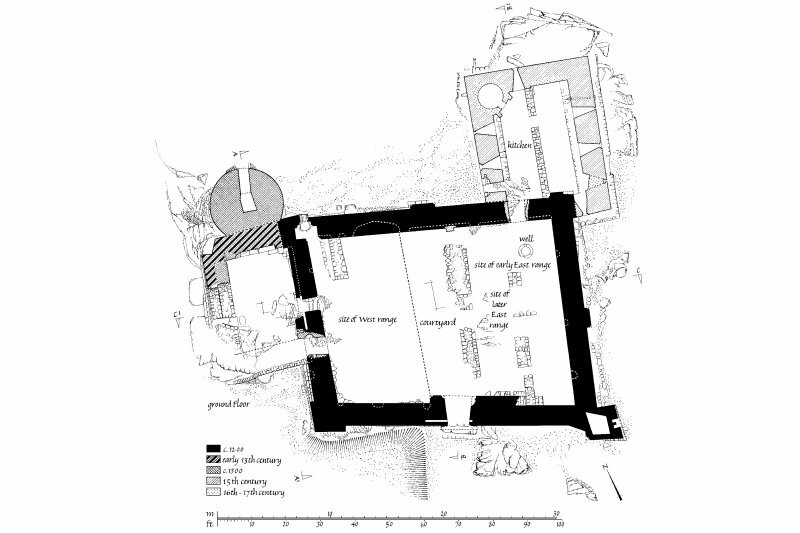 Castle Sween; plan of Ground Floor. 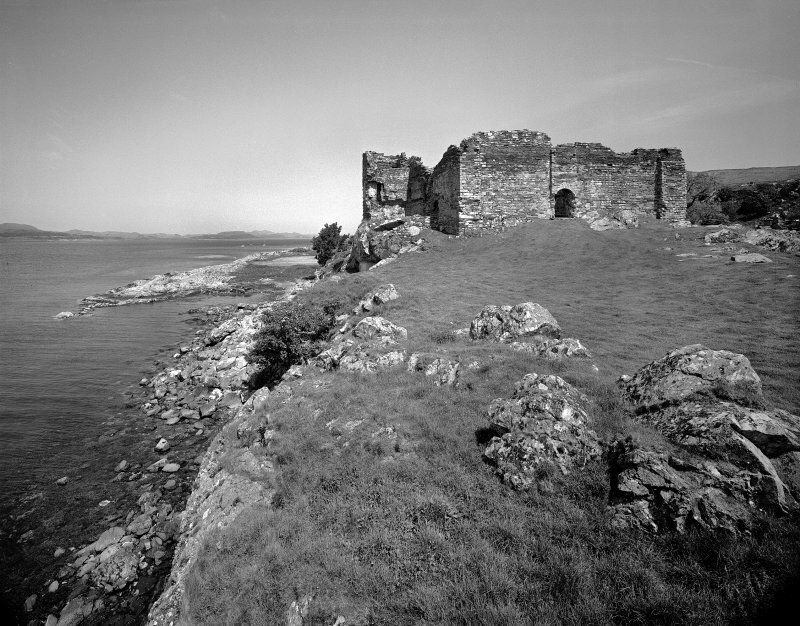 Castle Sween, interior. View of North-West platform on East wall, showing roof raggle and postern. Castle Sween, interior. 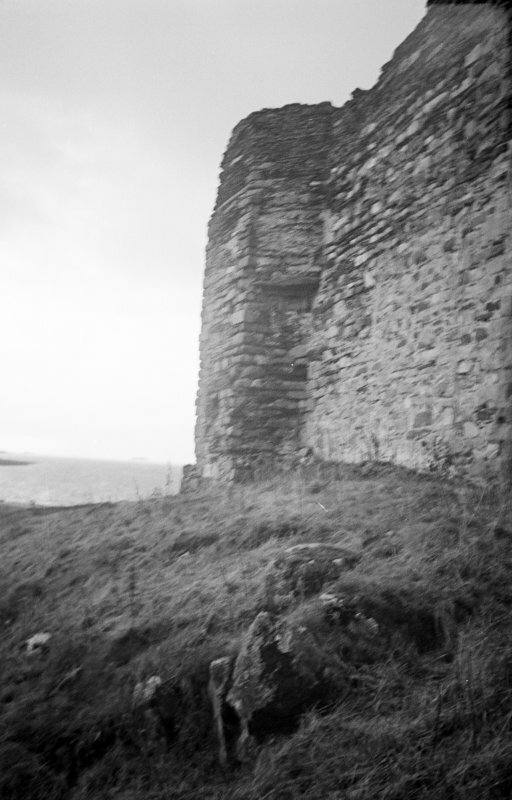 General view of East wall-walk from North-East turret. 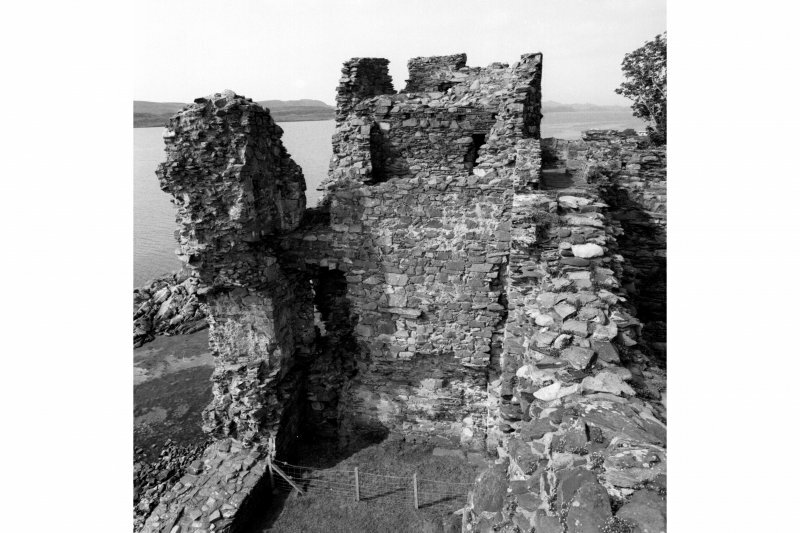 Castle Sween, interior. General view of stairway in interior of courtyard. Castle Sween. 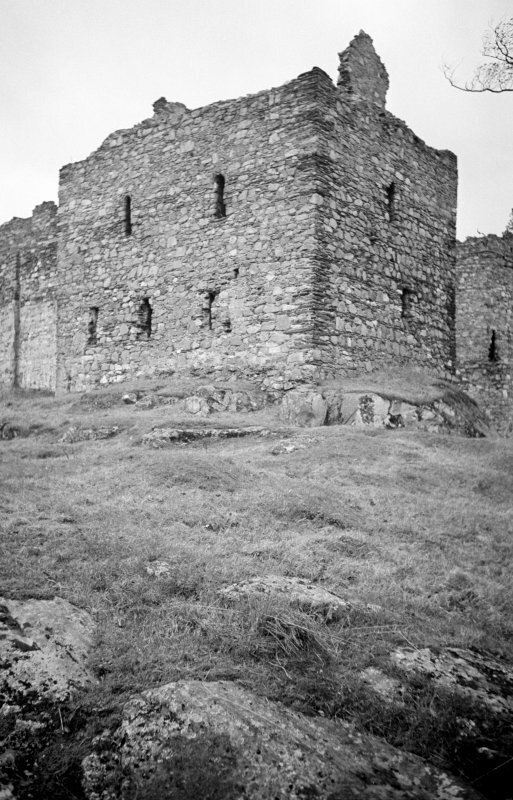 General view of main entrance from exterior of Castle Sween. Castle Sween. 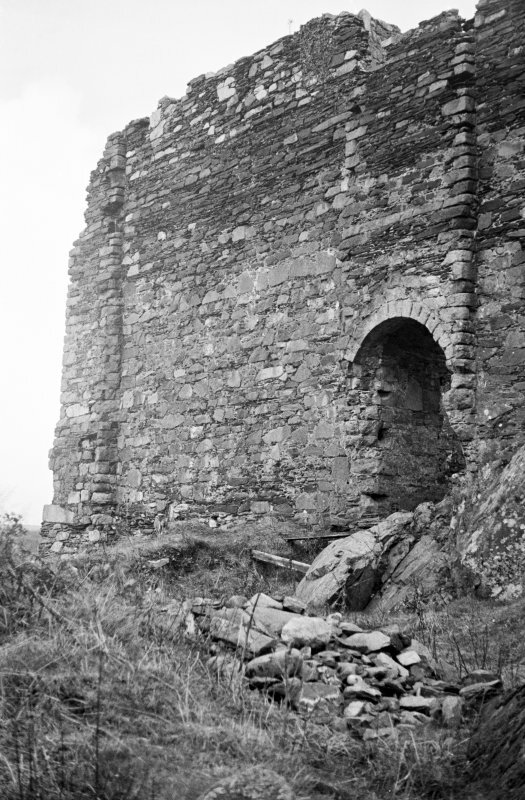 General view of angle between North wall and round tower on North side. Castle Sween. 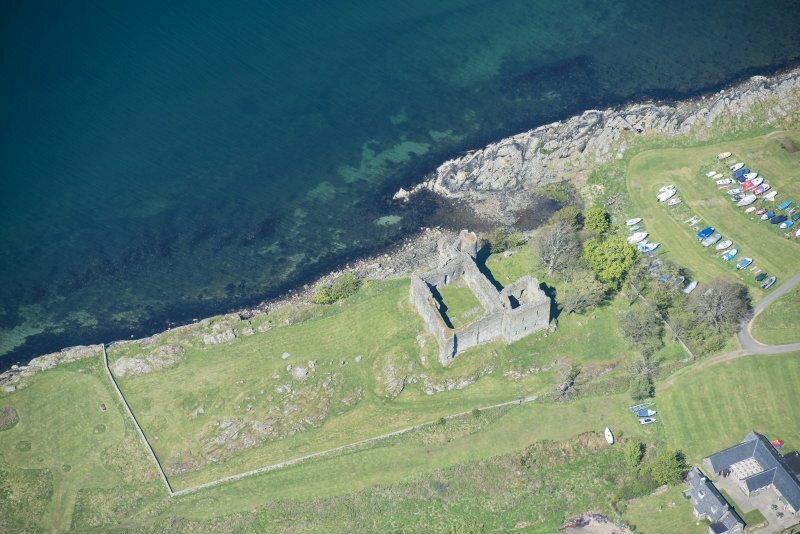 General view of Castle Sween from South-West. Castle Sween. Distant view from South. Castle Sween. 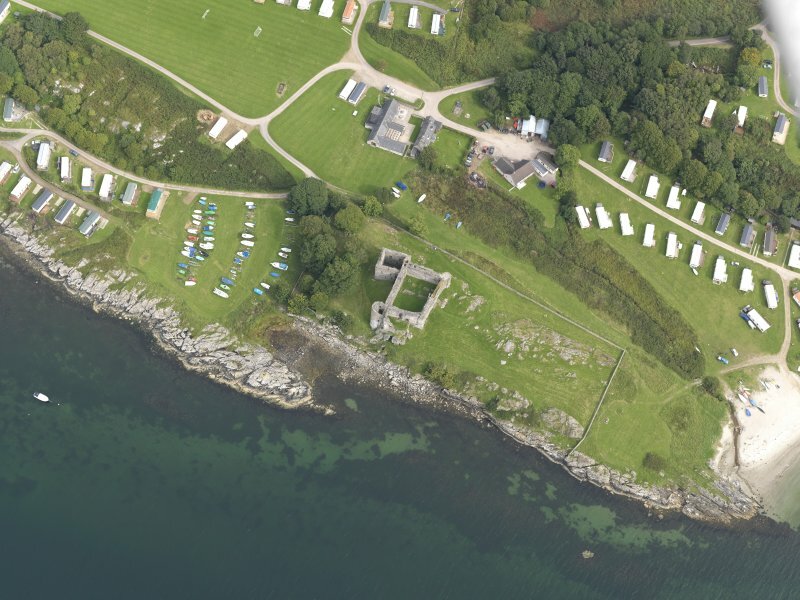 Aerial view from the South-West. Castle Sween, interior. 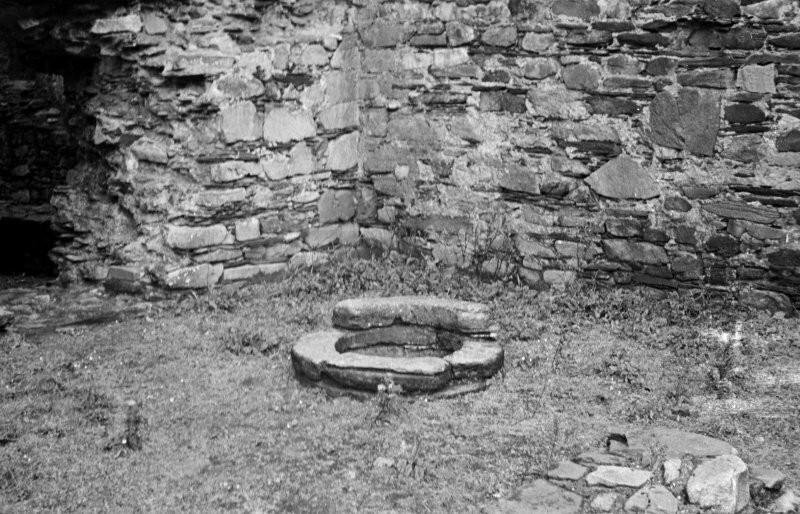 General view of well. 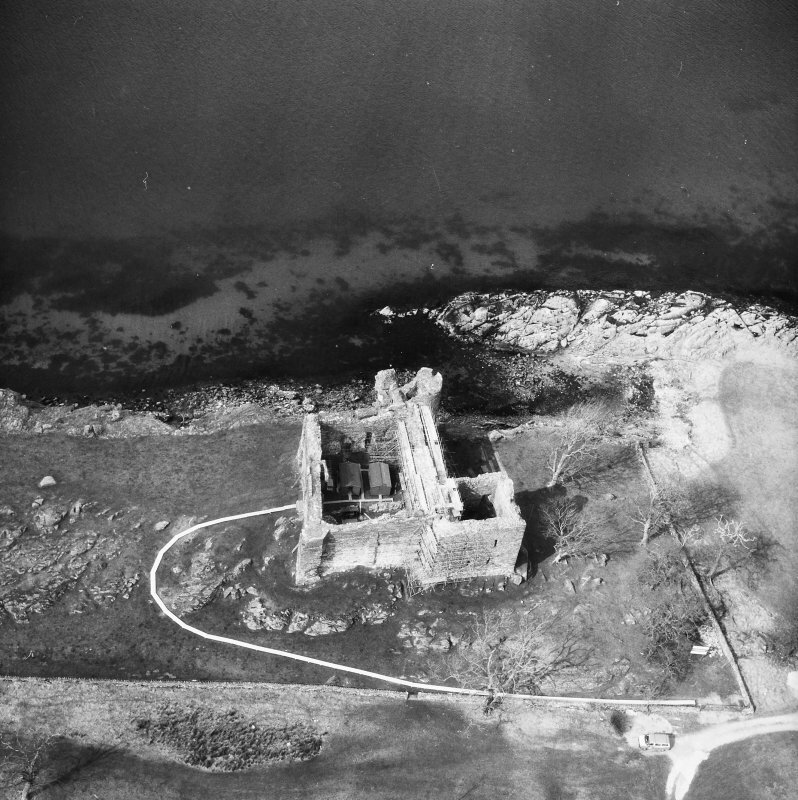 Oblique aerial view of Castle Sween, taken from the NE. Castle Sween. View from South-West. Castle Sween. General view from South-West. Castle Sween. General view of South-West facade. Publication drawing. 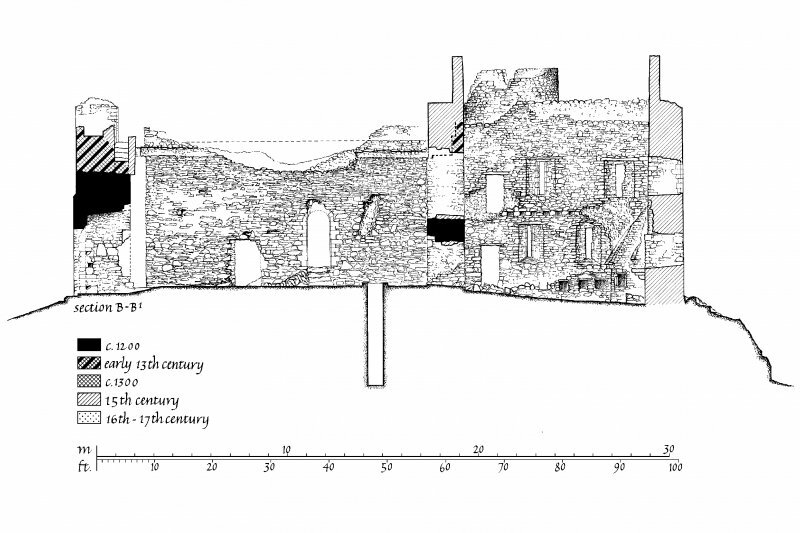 Castle Sween; phased plan of parapet and upper floor of North-West tower. Castle Sween. 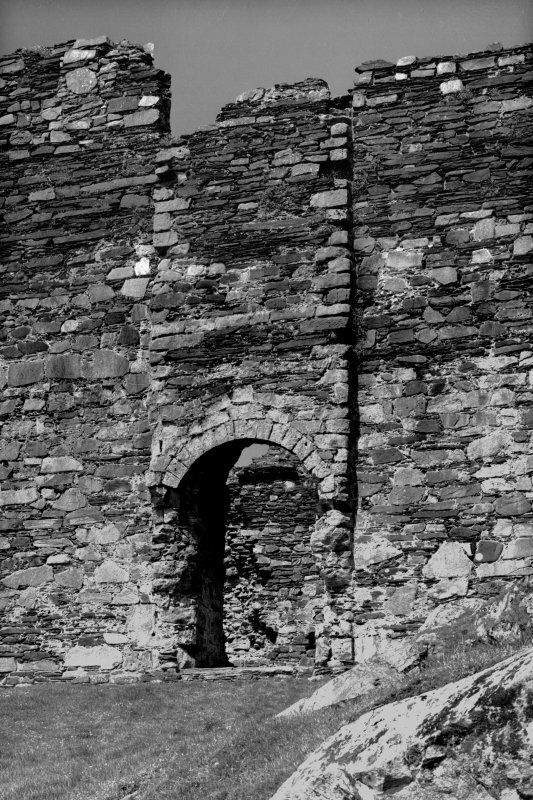 Detail of masonry arch supporting North-West platform on West side. Castle Sween. 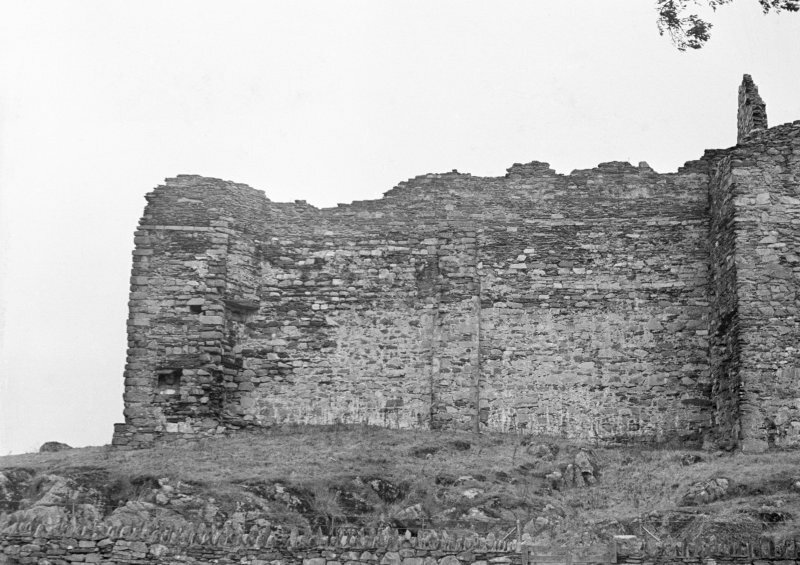 General view of West wall and round tower from North-East. Castle Sween. 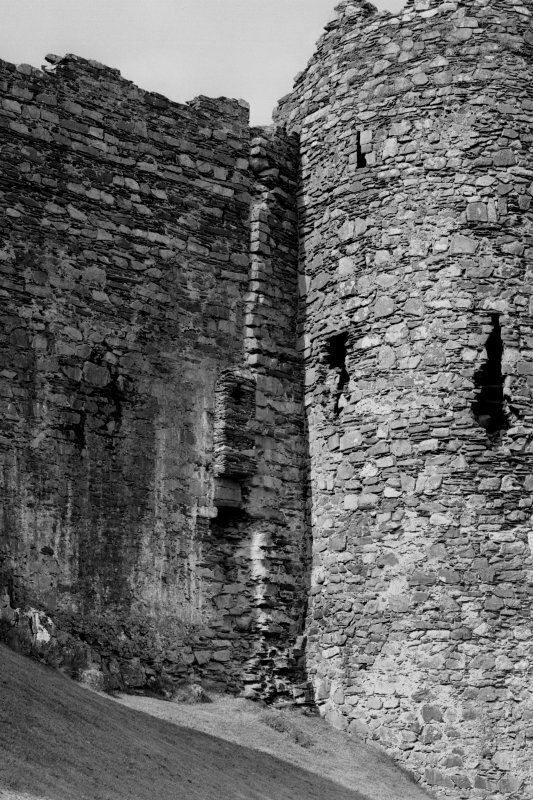 Detail of garderobe at East corner. Castle Sween. Detail of pilaster on North-East side. Castle Sween. View of North extension from North. Castle Sween. 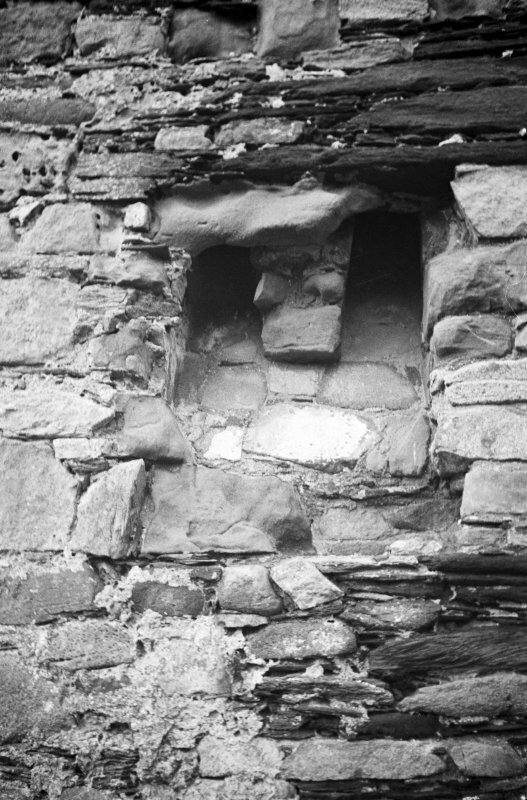 Detail of window head in North extension. 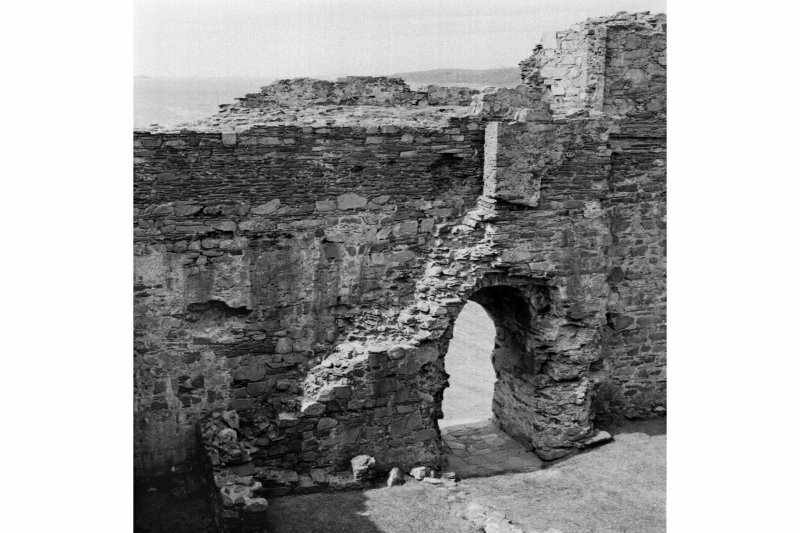 Castle Sween, interior. 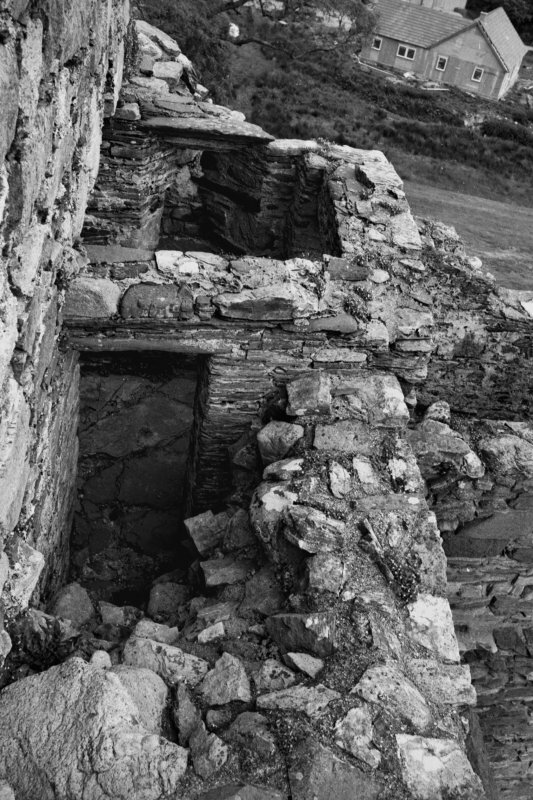 Detail of shoot at floor level in outer room near West corner. 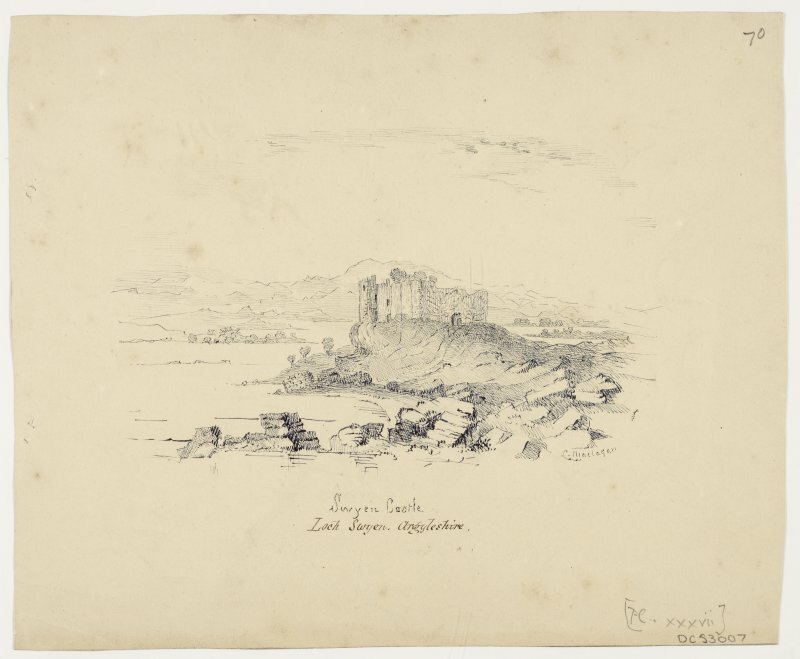 Publication drawing. 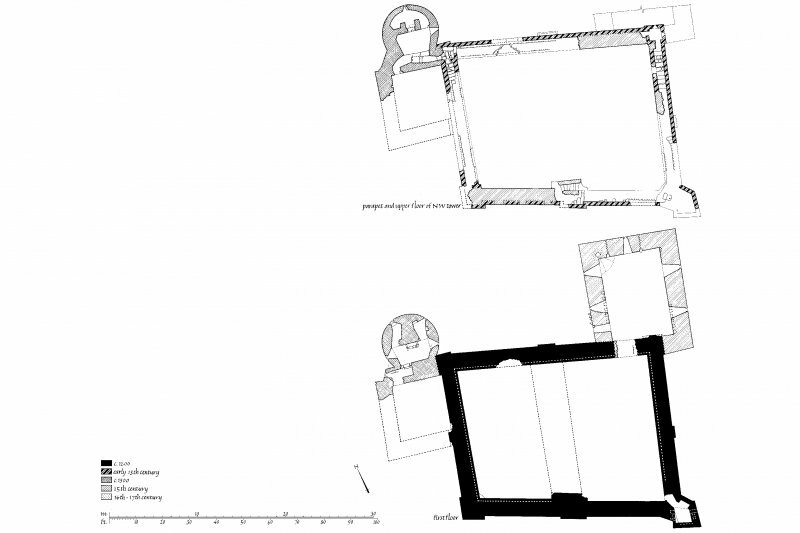 Castle Sween; phased plan of first floor. Castle Sween, interior. 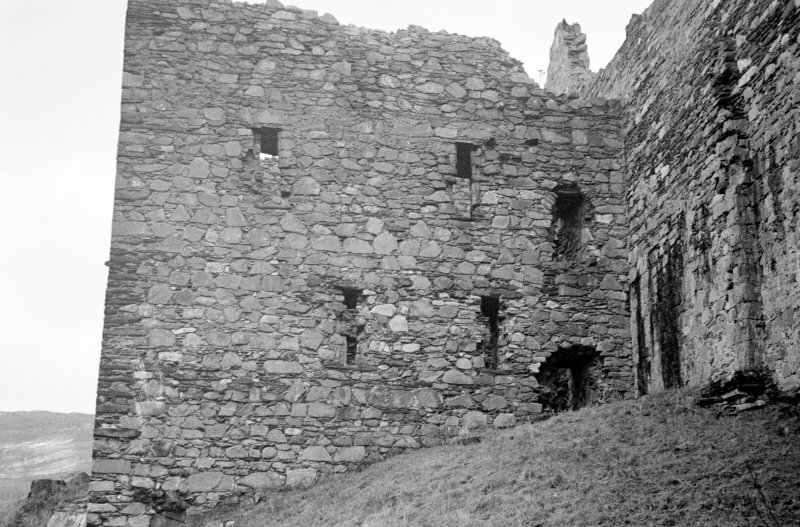 General view of North wall-head showing kitchen tower and courtyard. Castle Sween, interior. 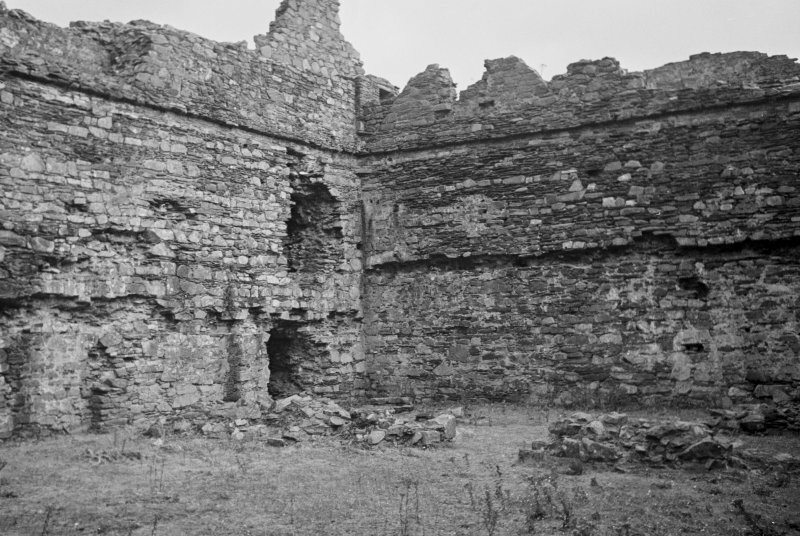 General view of interior of West wall of courtyard. Castle Sween. General view from North-West. Castle Sween. General view from North-East. Castle Sween. 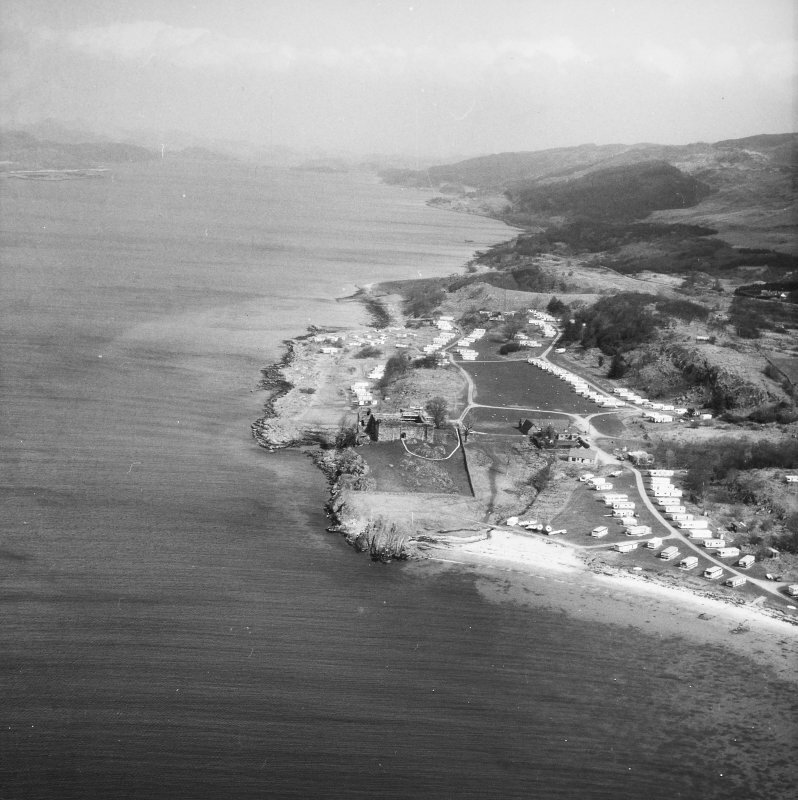 Aerial view from North. Castle Sween. 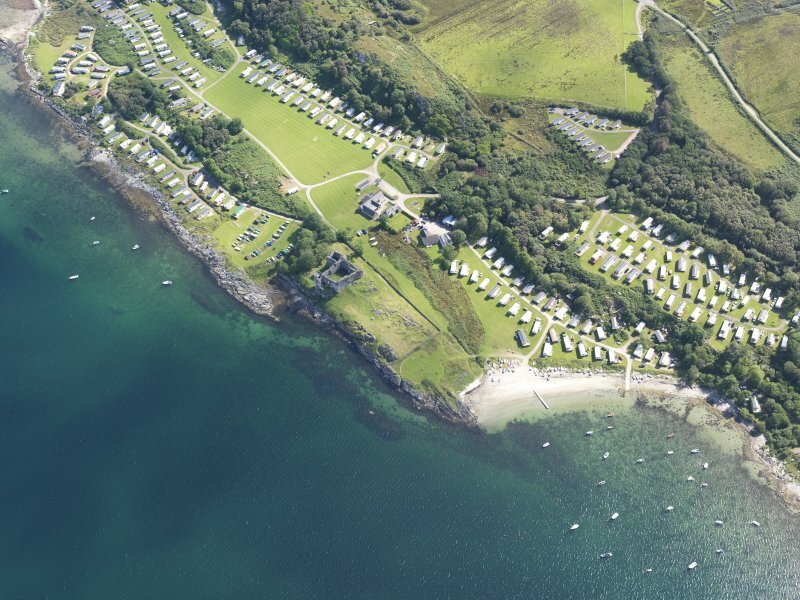 Aerial view from the South-East. Castle Sween. Detail of a windowhead on first floor North extension. Castle Sween. 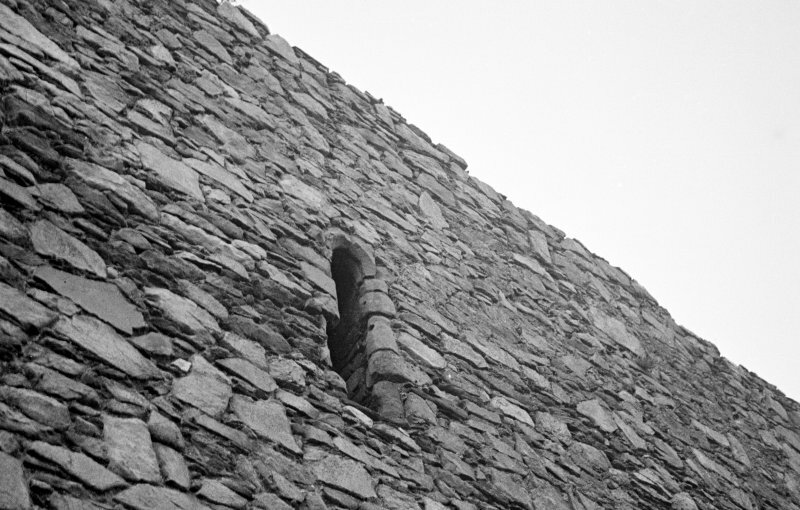 View of windows on East side of round tower. 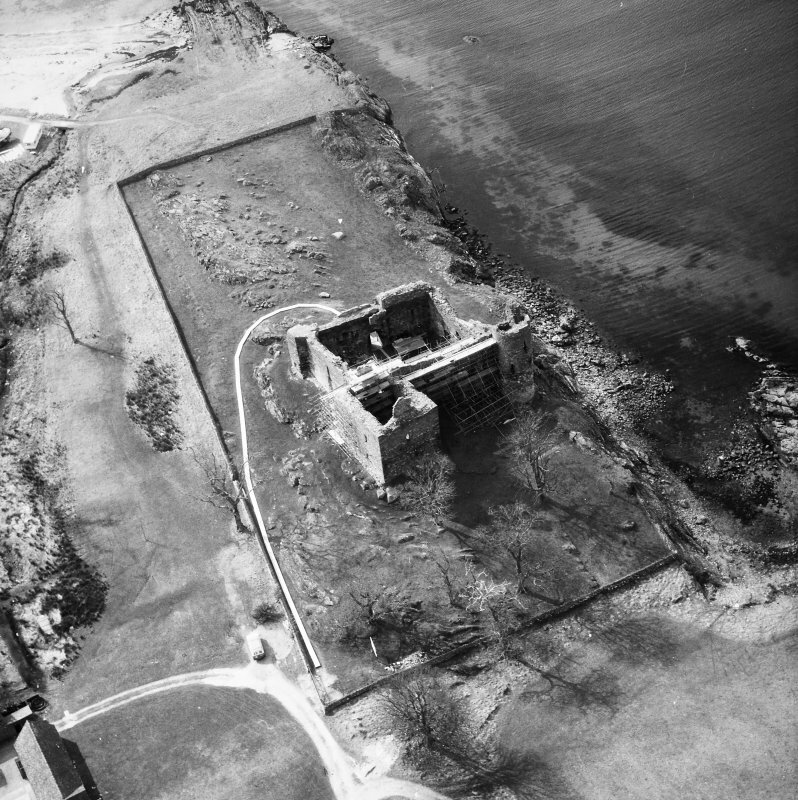 Oblique aerial view of Castle Sween, taken from the WNW. Castle Sween. Detail of ingoing water shoot in aumbry in North corner of Ground Floor of North Extension. 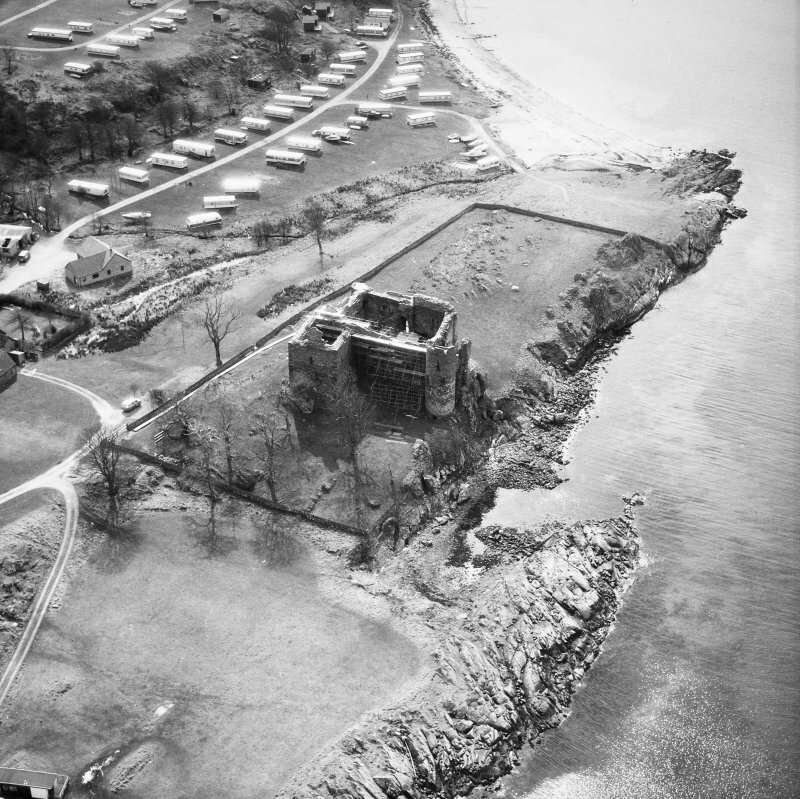 Castle Sween. 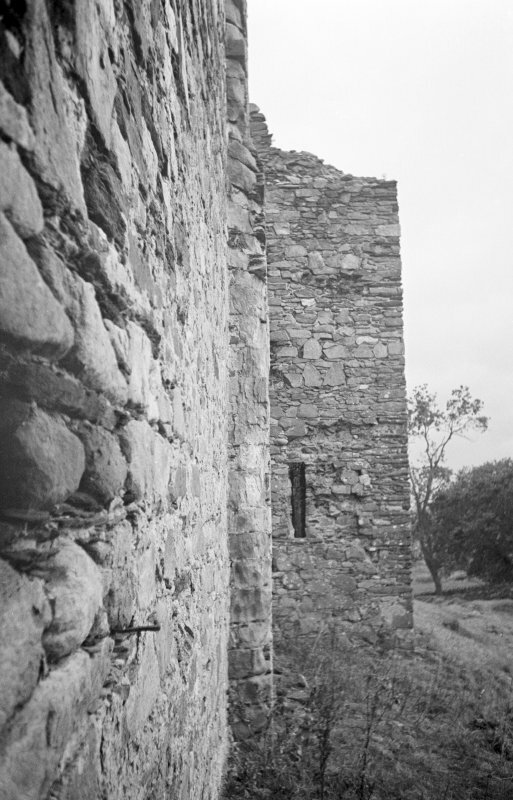 View of kitchen tower from South-East angle. Castle Sween, interior. View of pilaster in North-West side. Castle Sween. 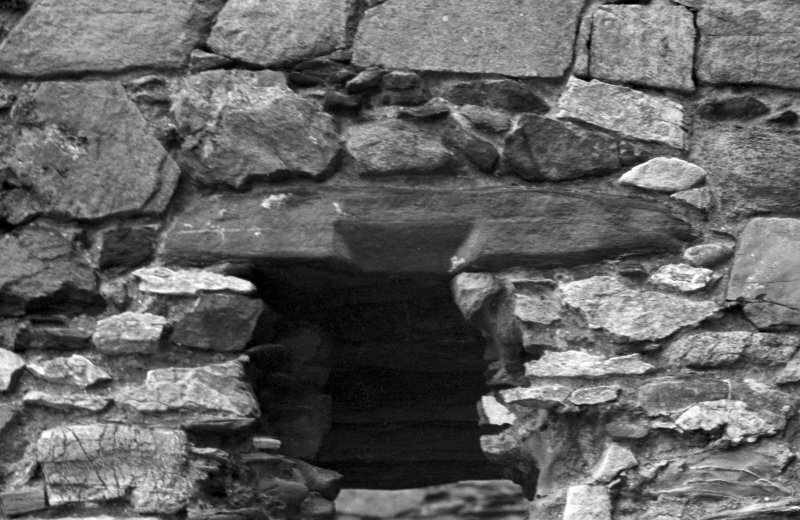 Detail of window head and projecting stones on first floor of North extension. Castle Sween. General view from North. Castle Sween. 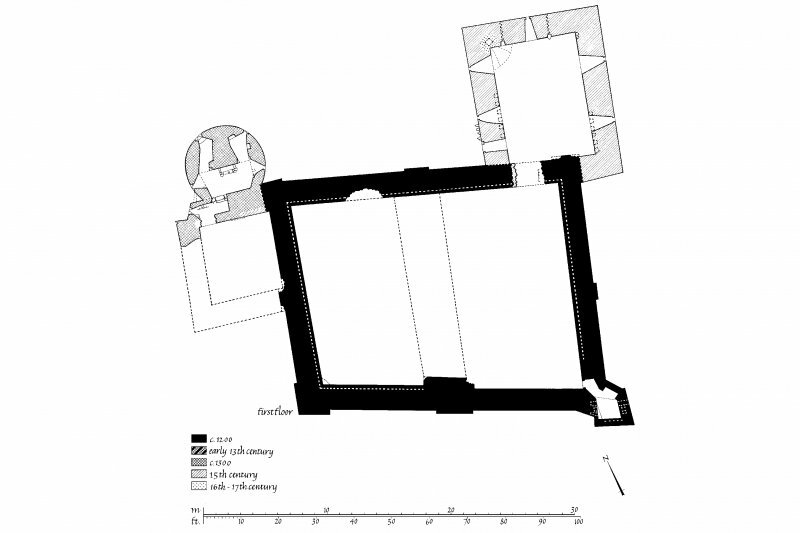 Photographic copy of plan of ground floor. Castle Sween. General view from the South-East. Publication drawing. Castle Sween; plans of first floor, parapet and upper floor of North-West tower. 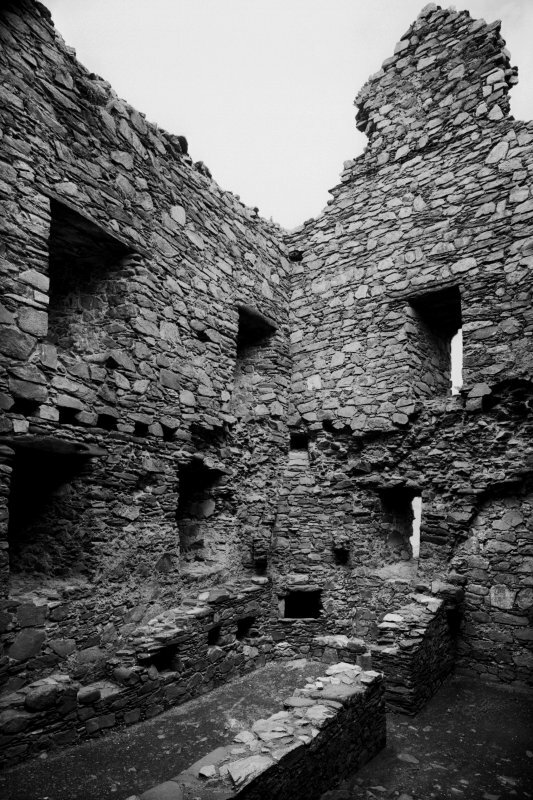 Castle Sween, interior. 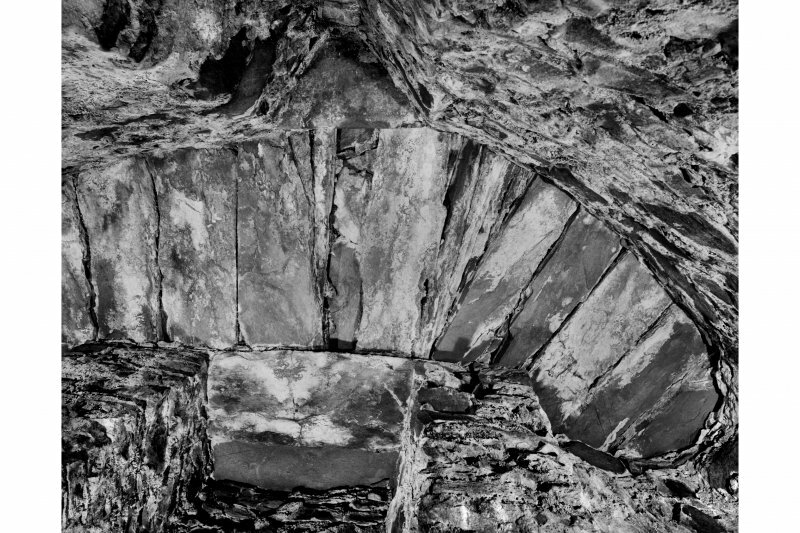 Detail of slabbed ceiling in upper garderobe chamber in North-West round tower. 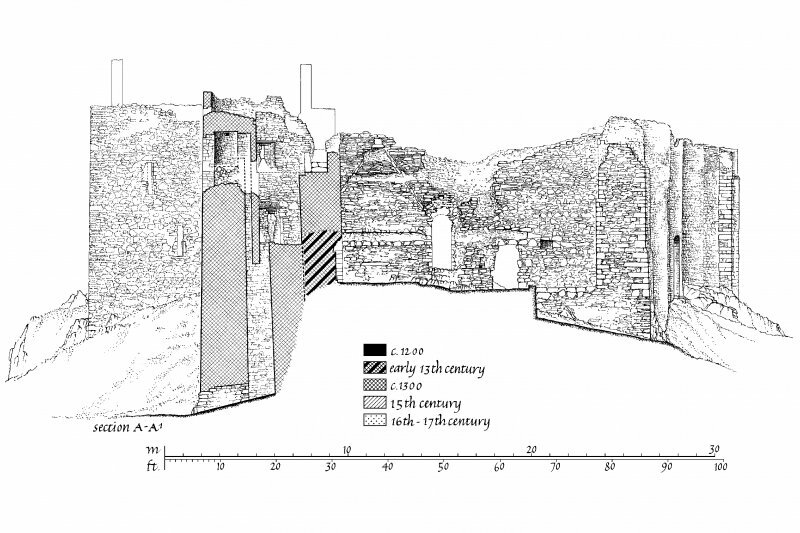 For industrial remains (including kilns and platforms) towards SE corner of curtain-wall enclosure, see NR77NW 1.02. 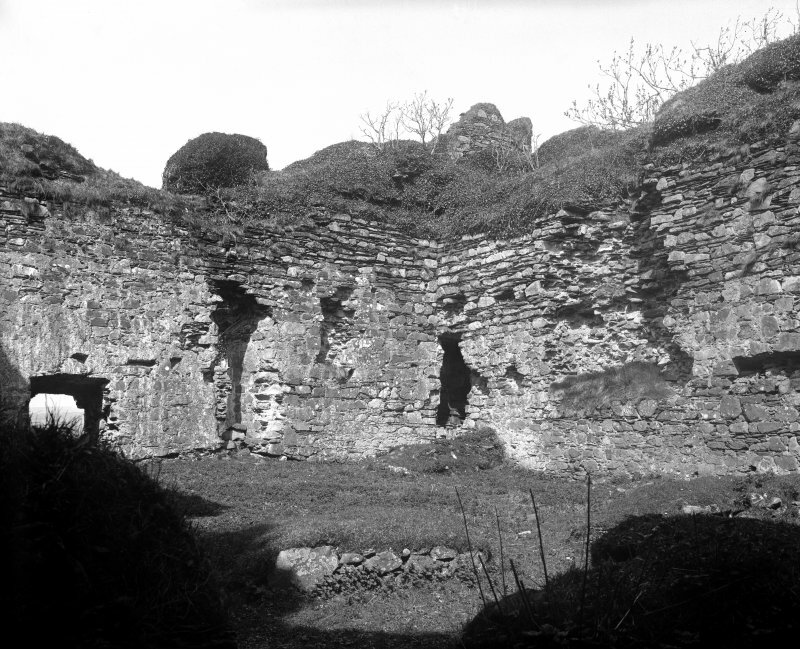 Castle Sween, now ruinous, was probably built in the mid-12th century (S Piggott and W D Simpson 1970). 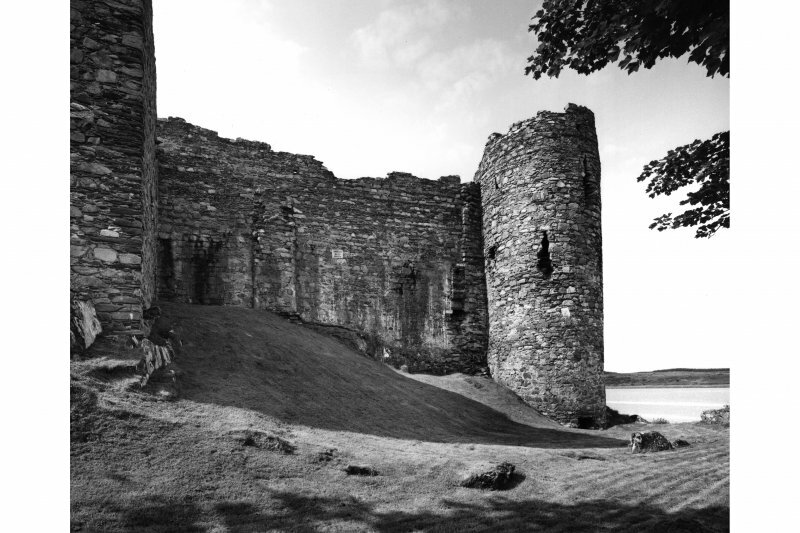 The main structure, a quadrangular enclosing wall, 6'-7' thick, measuring 84' x 70' over all, against the inner face of which three main ranges of timber buildings were originally disposed round a small court, is Norman in appearance. 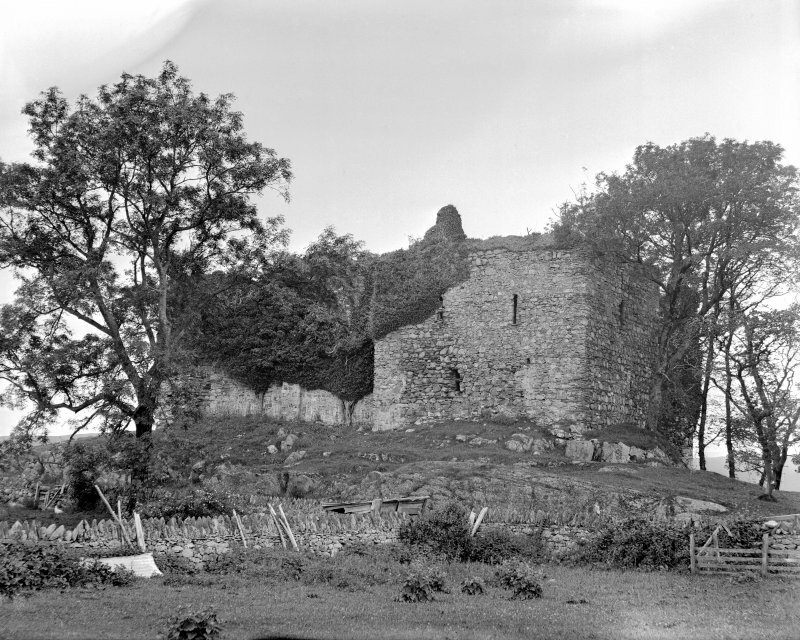 The annexe to the W and its round tower - Macmillan's Tower - were probably added in the early 14th century, while the rectangular keep was probably added to the NE corner in the 16th century. There is also a well, doubtless original, in the NE angle of the courtyard. 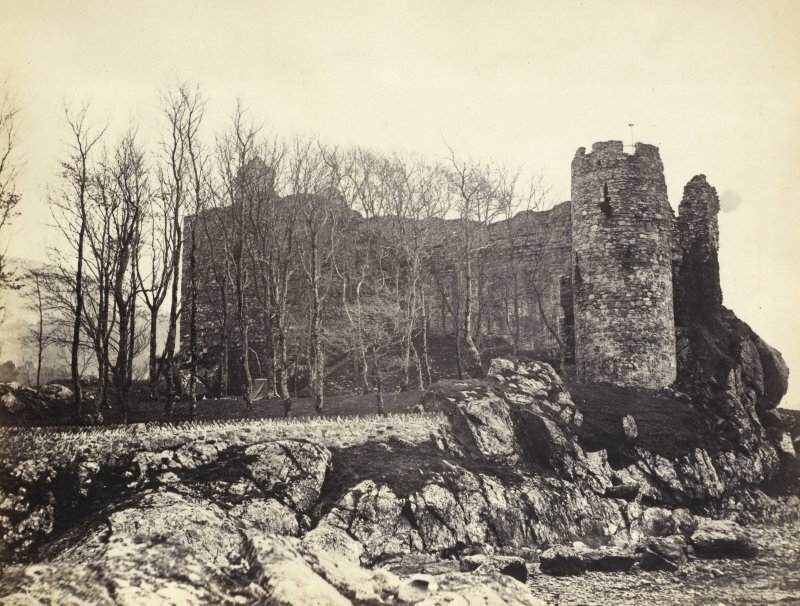 The castle was beseiged by Robert the Bruce, and was finally destroyed by Sir Alexander Macdonald in 1647. S Piggott and W D Simpson 1970; W D Simpson 1967; J G Dunbar 1966. The castle is as described and planned. No change to the report of OS (DWR). 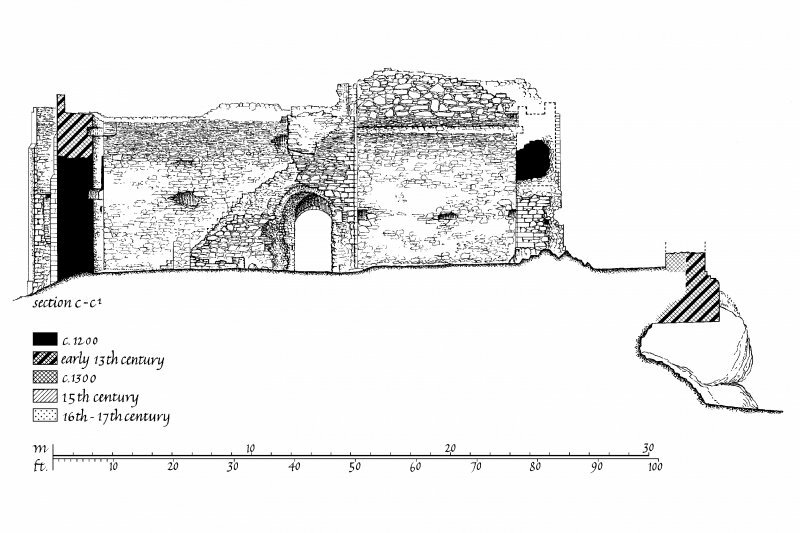 Two small-scale excavations within the E half of the courtyard of this castle revealed a sequence of domestic and service ranges, culminating in an elaborate industrial complex, all of which broadly echoed the succession of families associated with the site. 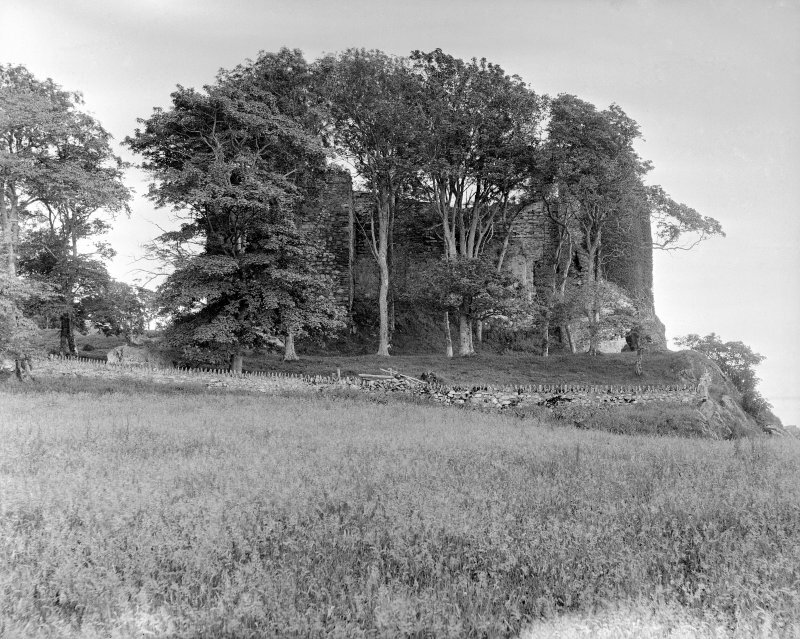 The original simple enclosure castle as occupied by the MacSweens until the mid 13th century may have featured some form of tower-like structure in the NE corner of the enclosure. 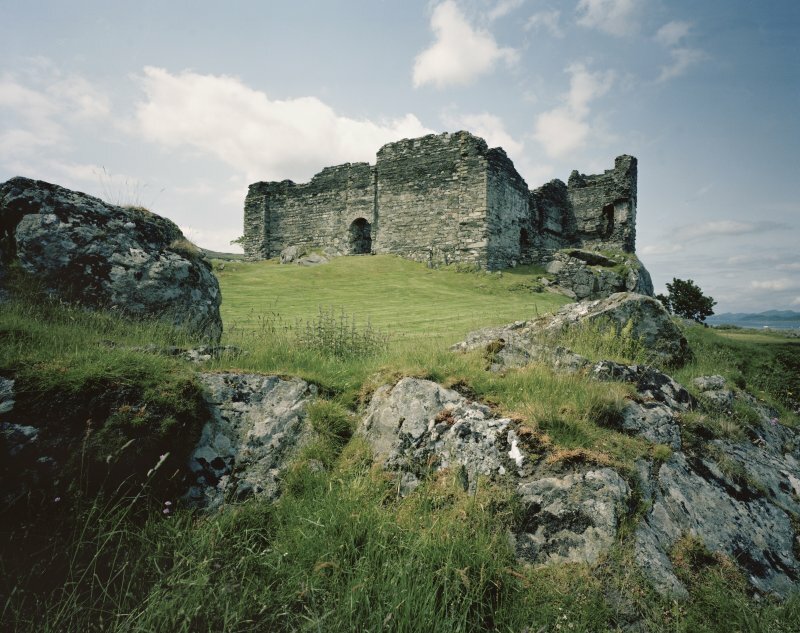 The site was then extensively remodelled under the Stewart Earls of Menteith, who built two towers outside the W wall of the primary enclosure, and a stone-built N range inside (c.1262 to 1362). 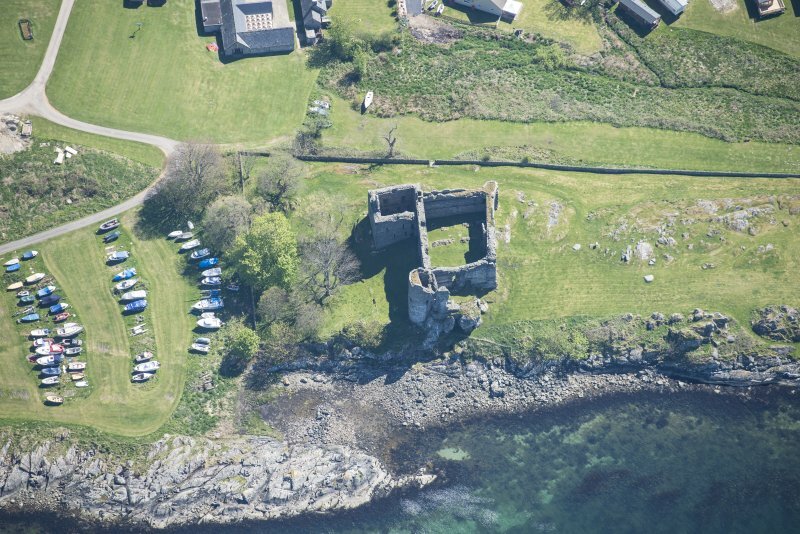 When the site was later occupied by the MacNeills of Gigha on behalf of the Lords of the Isles, a substantial E range with first floor hall, was built within the courtyard, to compliment the new NE or 'Macmillans Tower' during the 15th century. 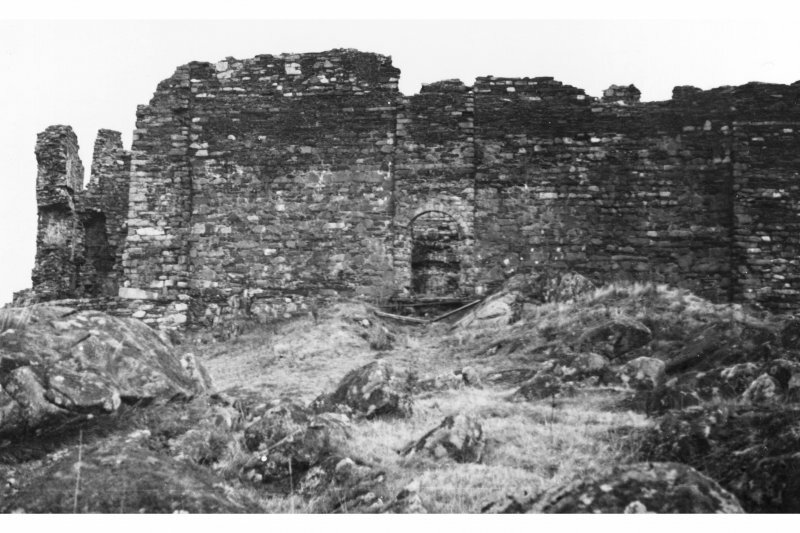 Finally, with the discovery of a series of kiln-like structures and ancillary sheds and compounds, it was evident that up to the end of its active life, under the Earls of Argyll c.1650, the E courtyard was largely cleared of major buildings and the area given over to industrial usage, probably metal working. 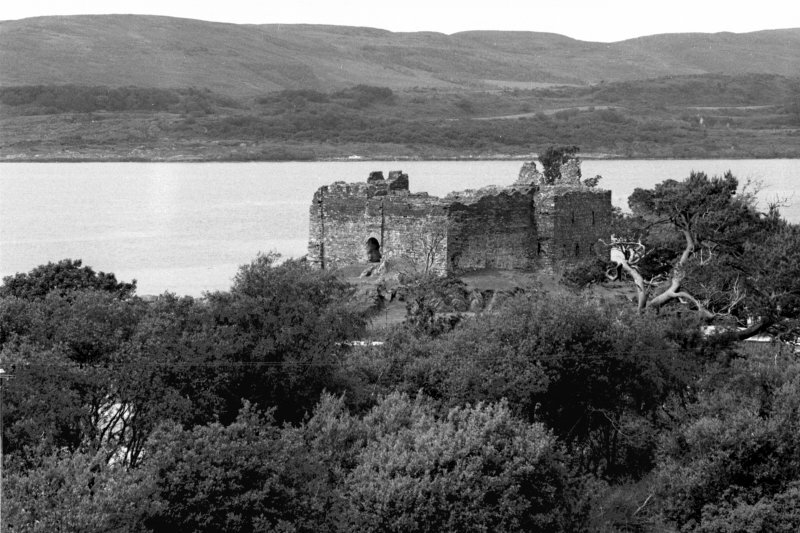 Little is known of the castle's history but it was probably besieged by Robert Bruce during his campaigns in the west Some impression of the more civilised aspects oflife in the castle is provided by the description of the meeting between John, Lord of the Isles and Earl Douglas in 1483, probably at Castle Sween; the former received 'right great gifts' of clothes,wine, silk, English cloth and silver, and offered Earl Douglas a present of mantles. 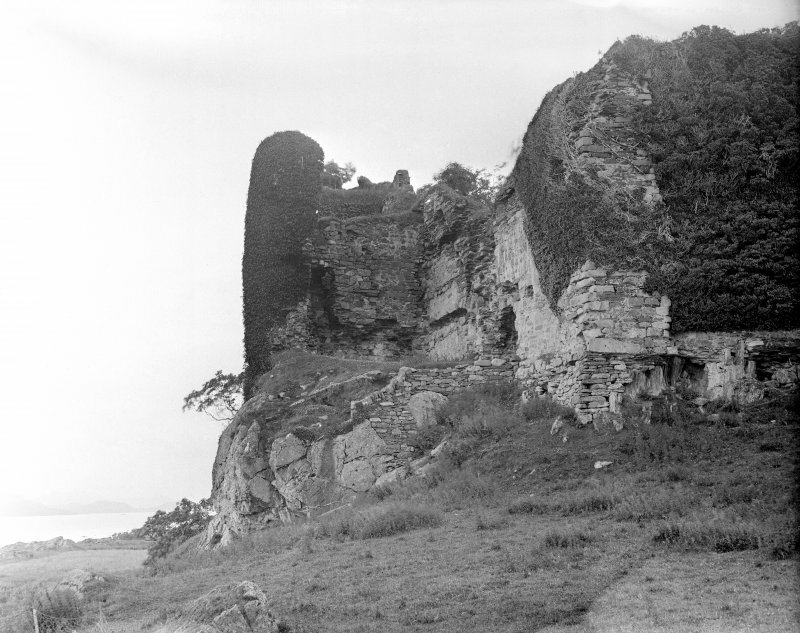 The castle became ruinous after attack by Colkitto in 1647. 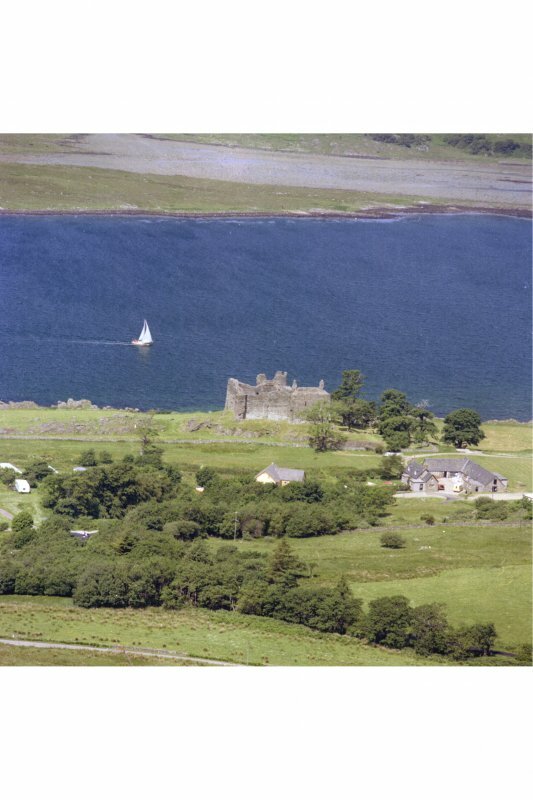 The castle is situated on the N summit of a low rocky ridge on the E shore of Loch Sween, about 3km from the mouth of the loch. A level valley-bottom some 150m in width separates it from rising ground to the E, and it commands an extensive prospect of Loch Sween itself and, to the W, Jura. Immediately NW of the castle a small inlet has been cleared of rocks to provide a boat-landing, while 160m to the SSW there is a gently shelving sandy beach. 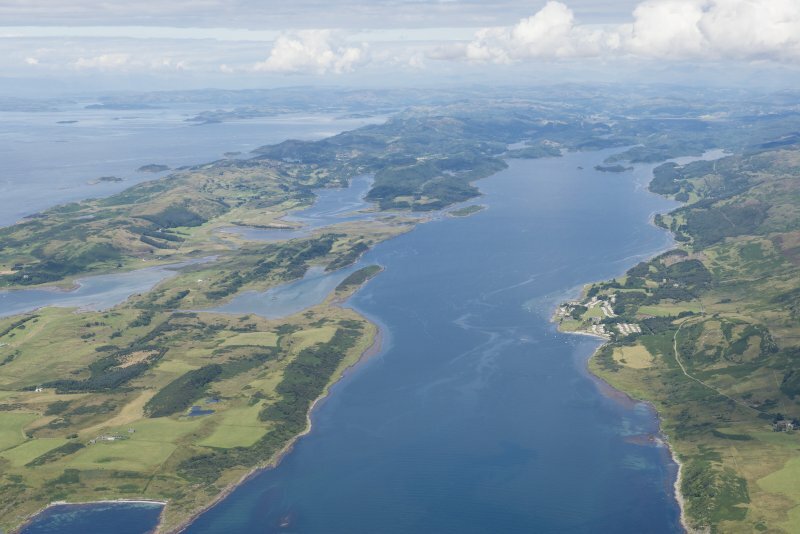 A more secure anchorage was available in the inner recesses of Loch Sween, in the Tayvallich area. 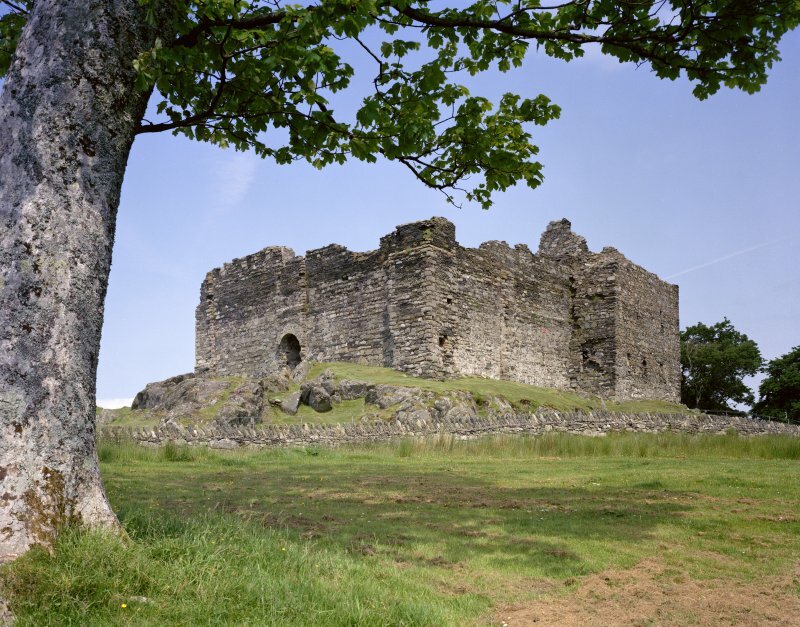 The rocks of the ridge on which the castle stands are bedded almost vertically, forming a series of rocky bosses interspersed with turf. 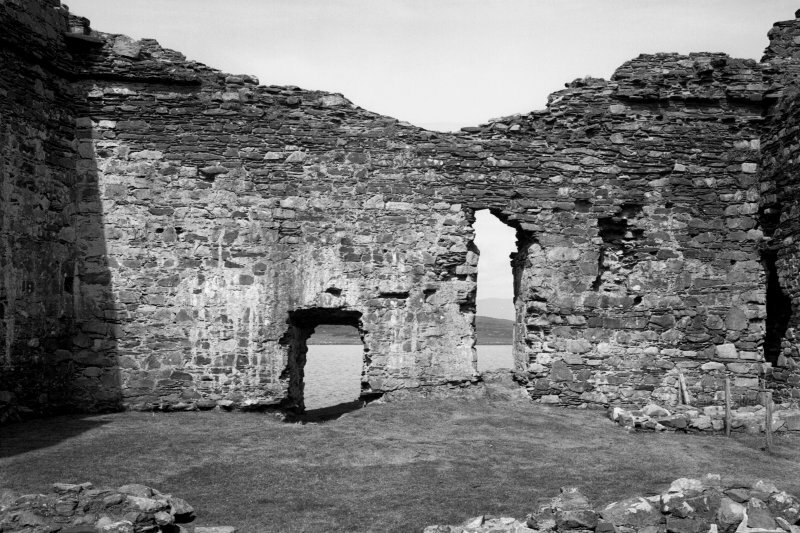 Within the building, outcropping is visible in the E part of the courtyard and in the NE and W towers, while in the curtain-walls occasional tongues of rock project above the level of the foundations, which for the most part accommodate themselves to the irregularities of the underlying surface. 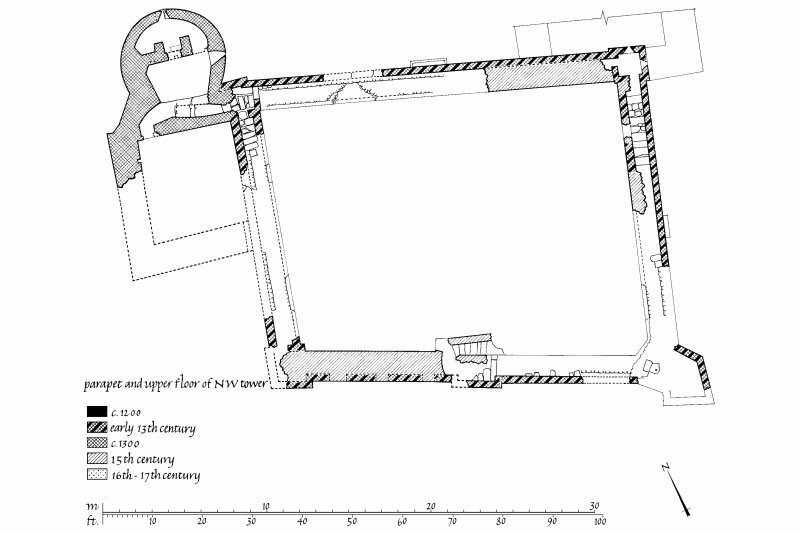 Whereas the original quadrangular enclosure is founded on a fairly level platform, except at the SW angle, the addition of the NE tower required a considerable amount of underbuilding, and the NW round tower extends 7m below the level of the courtyard. The enlargement of the W range involved building upon a shattered mass of rock with a rounded upper surface, penetrated on the W by a gully and underlain at the SW angle by a small cave. 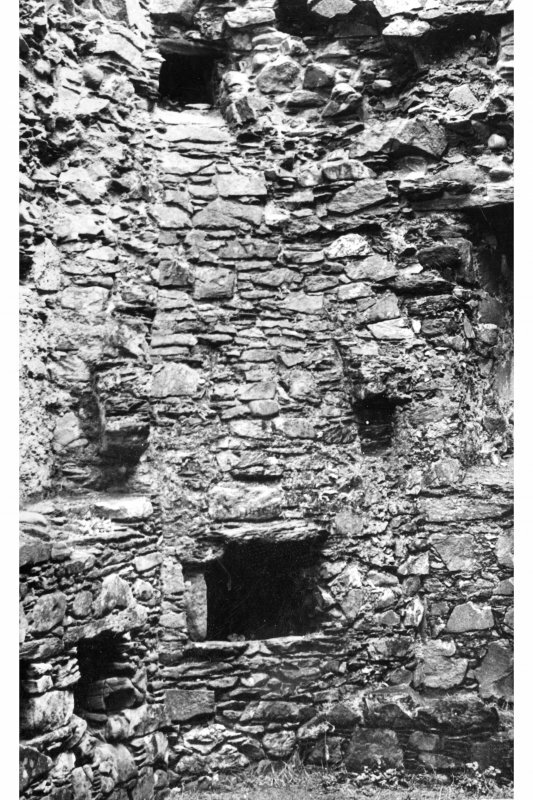 Underpinning was provided by roofing the249 gully with three courses of mortared chlorite-schist voussoirs carrying the footing-course of the W wall of the range. 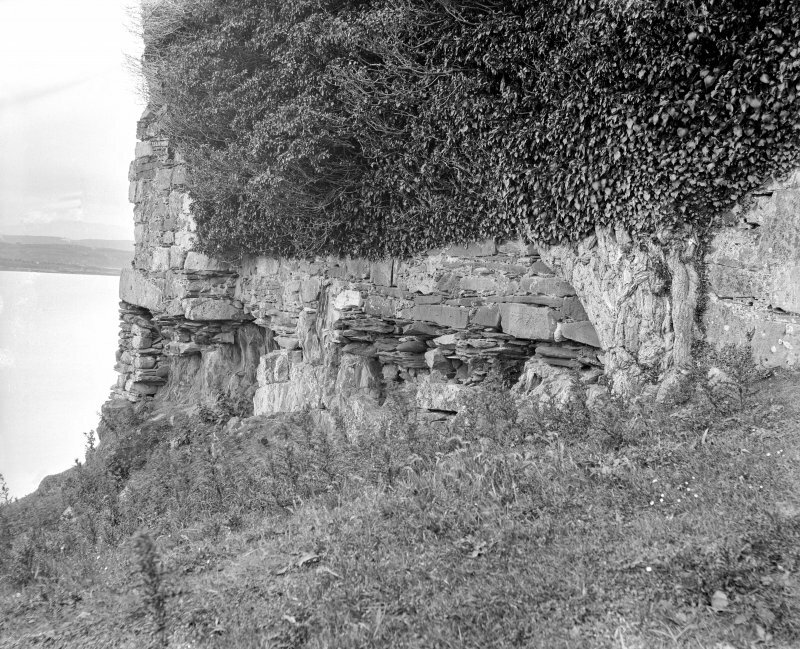 The E wall of the cave has been lined with masonry arranged in ‘herring-bone' fashion. To arrest continued movement of the rock in this area, a concrete support-pier was inserted in the cave in 1983. 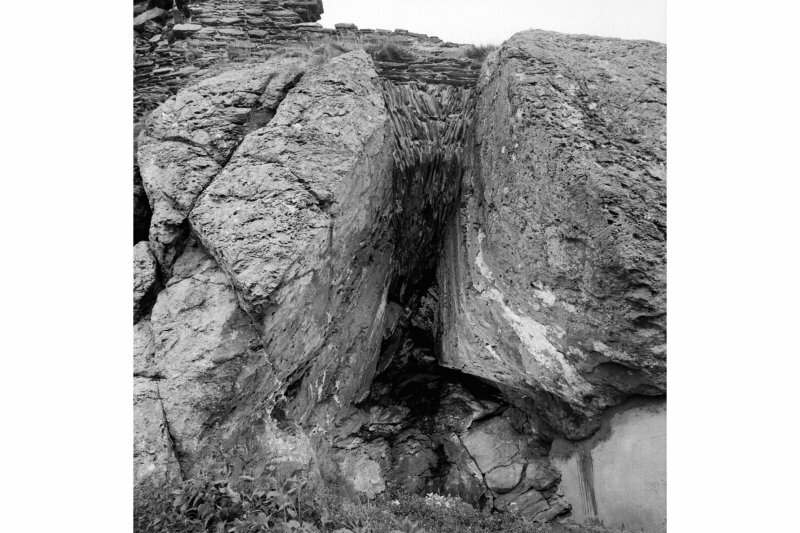 About 11m S of the S angle of the castle, a few courses of drystone masonry fill a gully in an otherwise uniform E facing rock-face some 3m in average height. About 10m further S the outcrop is interrupted by a trough, 7m in width, which may have been enlarged by quarrying and probably formed the main landward approach. 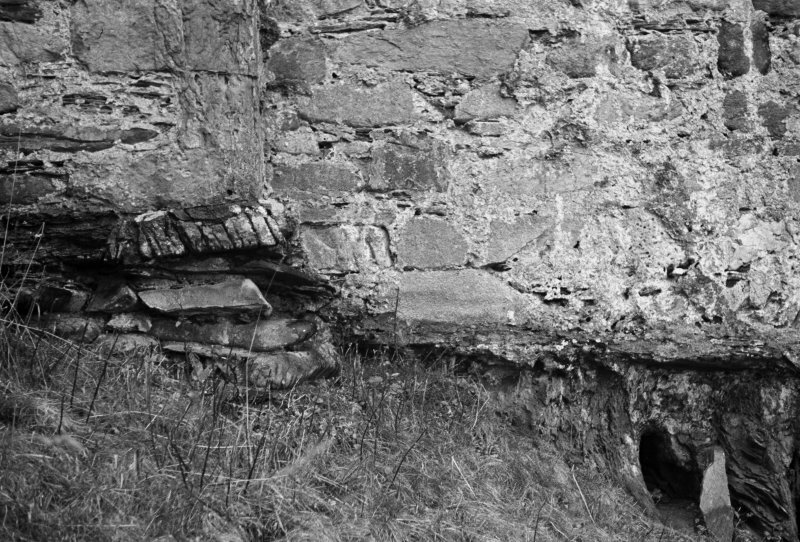 Several large tumbled boulders at the S edge of this trough may have fallen from a wall above, but there are no other identifiable remains of outer defences. 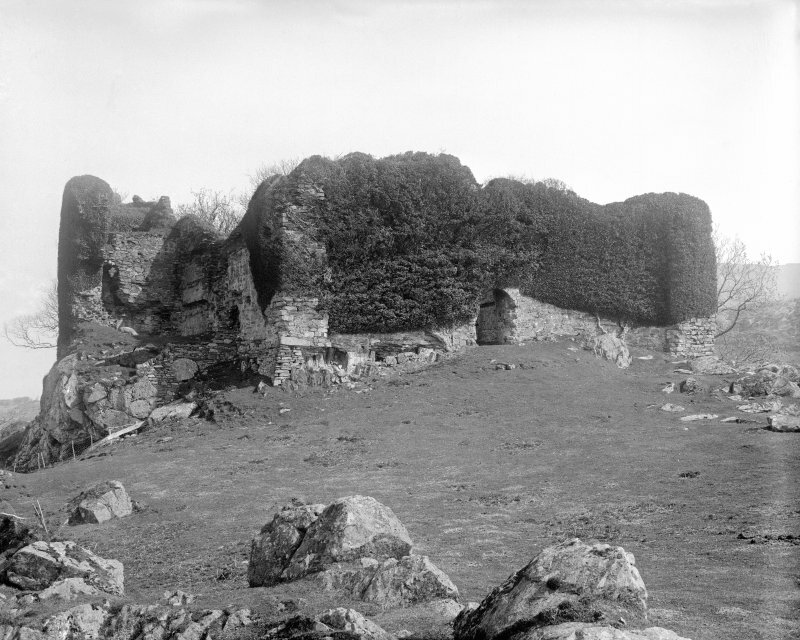 The earliest part of the castle, a quadrangular enclosure, was probably begun by Suibhne, ancestor of the MacSween family, about the end of the 12th century. Some recent scholars, following Simpson, have interpreted this as the lower part of an intended keep (en.1), but its irregular layout, comparatively limited wall-thickness and absence of windows all militate against this theory (en.2). It is probable that the later arrangement of a small courtyard flanked by ranges was planned from the first, but the upper parts of the curtainwalls, containing chases for the roofs of these buildings, are constructed of different materials and belong to a second phase, probably in the early 13th century. 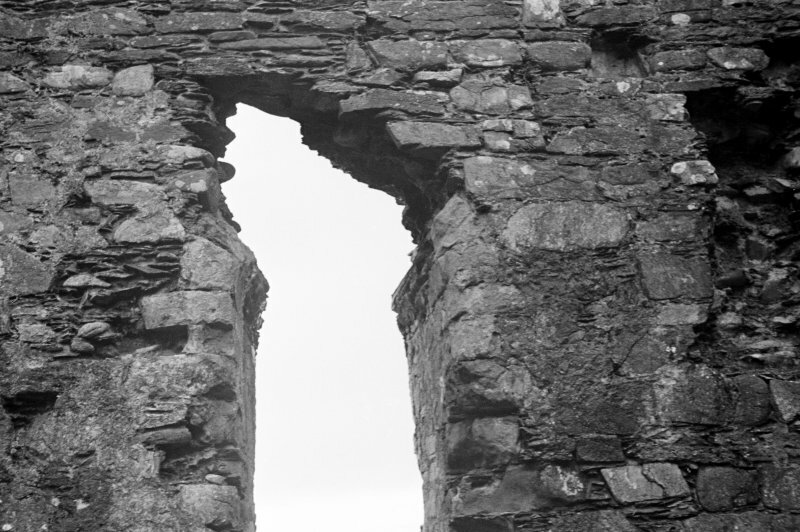 This work no doubt followed the original intention in height and layout, but that some changes were made is demonstrated by the blocking of a garderobe-chute at the SE angle. 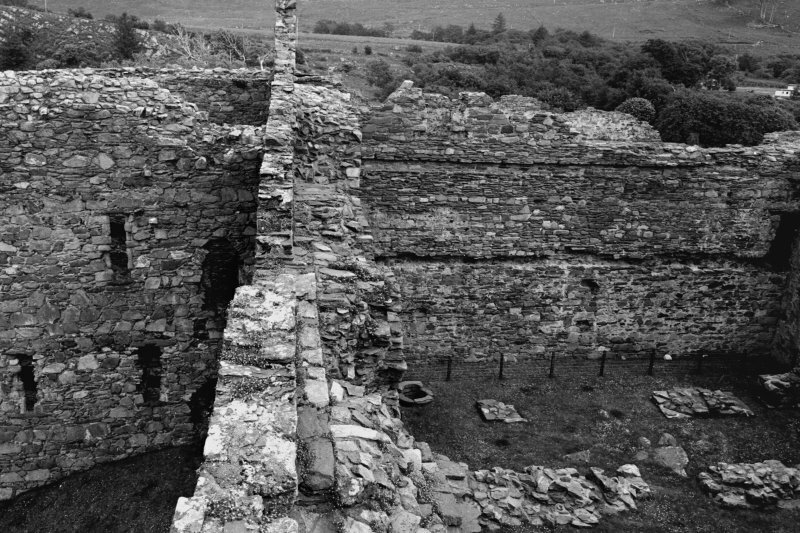 Probably at the same period, a small single-storeyed wing with attached garderobe was built on a terrace outside the W curtain-wall and at right angles to it. 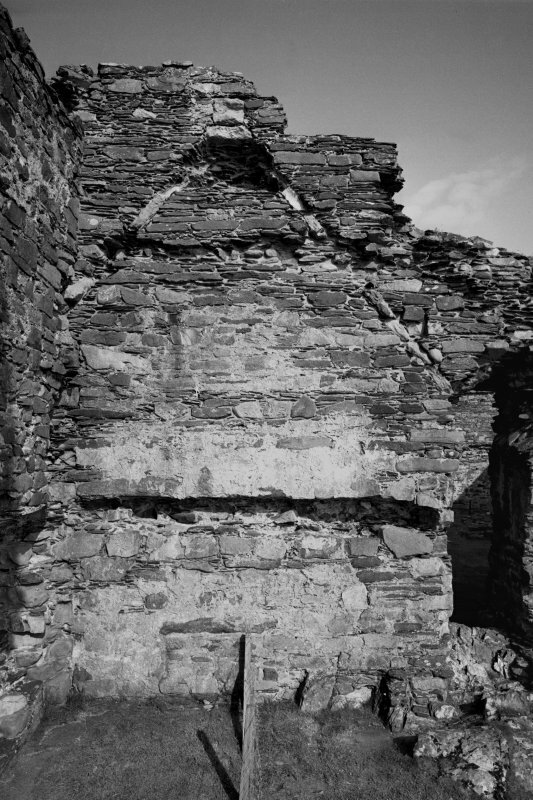 The earliest identifiable range to be completed in the courtyard was attached to the E half of the N curtainwall, but since the masonry of the surviving E gable differs from that of the early 13th-century wall-head on which it was set it cannot be closely dated. 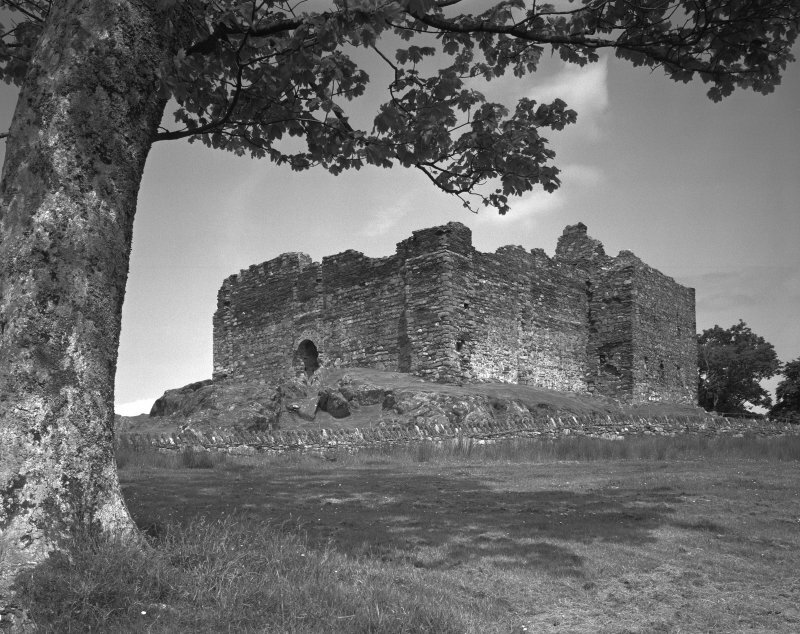 During the second half of the 13th century the MacSweens were replaced as Lords of Knapdale by the Stewart Earls of Menteith, and although an expedition about 1300 by John MacSween to regain the castle is the subject of one of the earliest Scottish Gaelic poems, it remained in the hands of the Menteith family for at least a century. 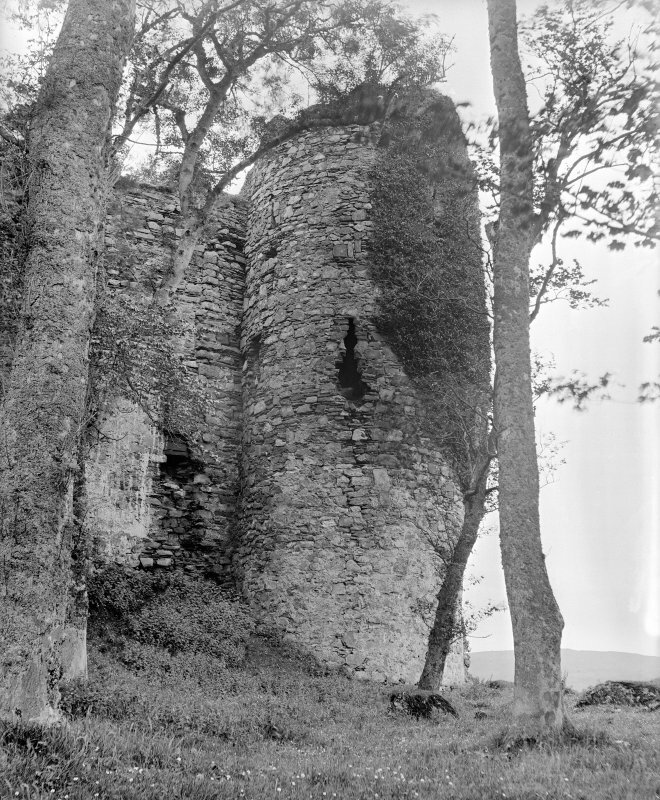 At about the beginning of the 14th century, when Sir John Menteith played an important role as the owner or constable of several castles in the Clyde estuary, the small W wing was incorporated into a three-storeyed tower with an attached circular garderobe tower of impressive height, lit by crosslet-slits. There construction of a mural garderobe at the NW angle of the courtyard probably belongs to the same period. 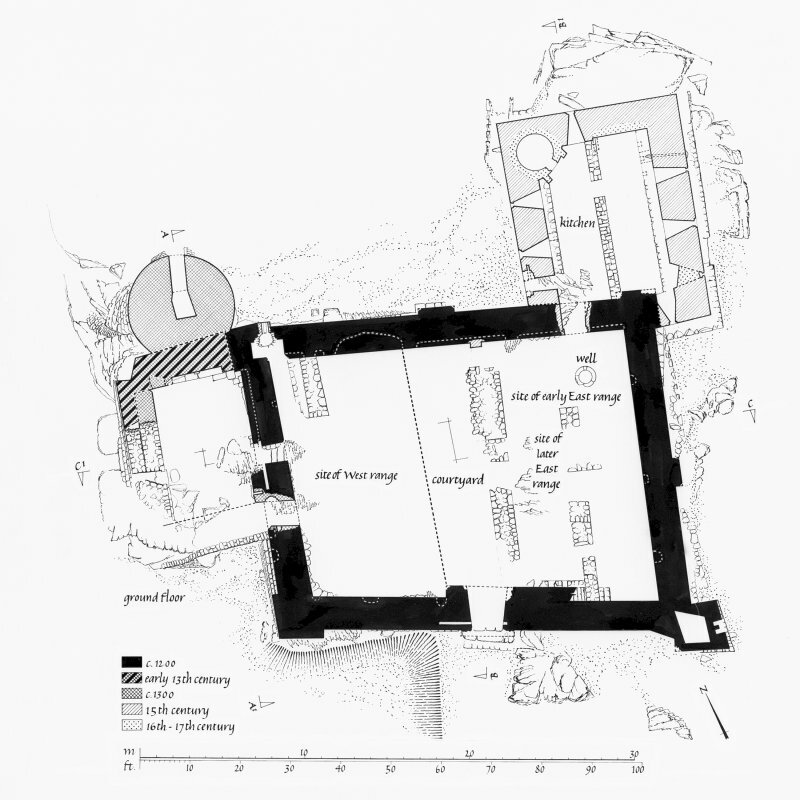 The final addition to the courtyard was the rectangular tower added to the NE angle, which contained a kitchen on the ground floor and a spacious chamber above. 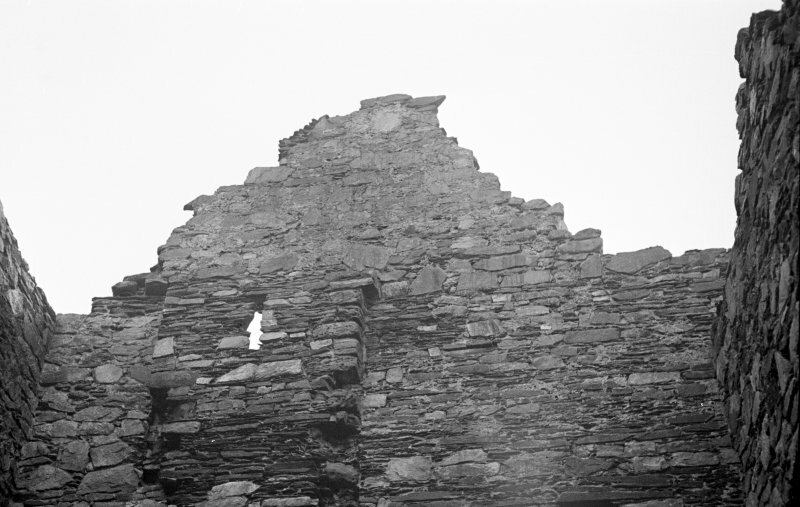 Although this has frequently been ascribed to the 13th century, partly because of two lancet window-heads which may be in re-use, it more probably belongs to the 15th century, when the MacNeill family of Gigha or their MacMillan kinsmen were constables on behalf of the MacDonald Lords of the Isles. 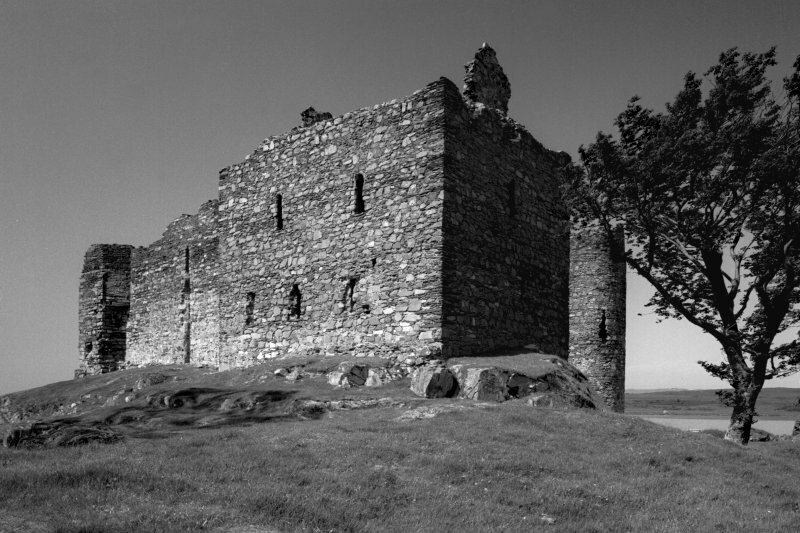 The tower was associated with a two- or three-storeyed range filling the E part of the courtyard, which presumably contained the great hall, and the continuity of the wall-walk was interrupted by the N gable of this range. 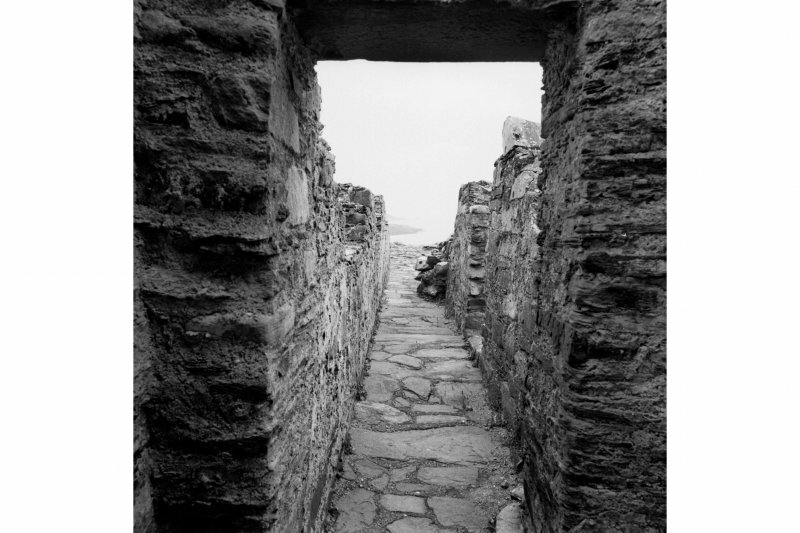 A parallel W range, leaving a narrow central corridor, was probably built about the same time. 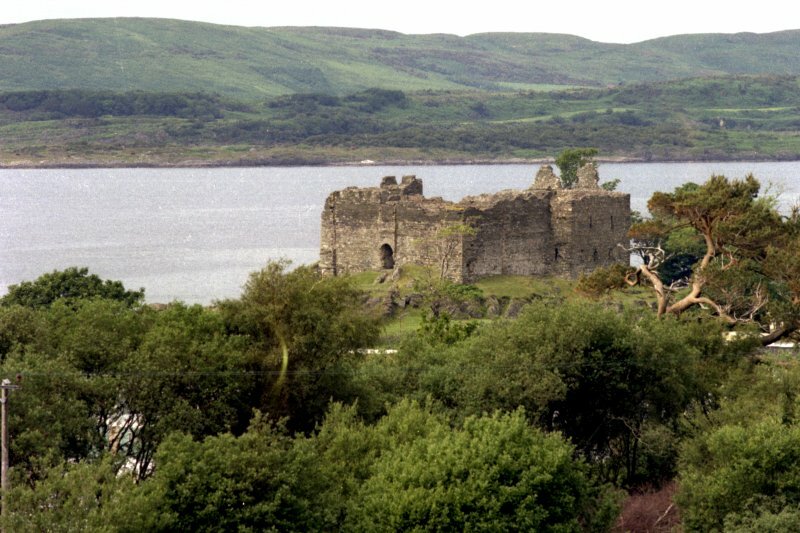 From the late 15th century the keepership of the castle was held by the Campbell Earls of Argyll, but the only building works that can be assigned to this period were the intended insertion of vaults in the kitchen-tower and E range, perhaps in the late 16th century. 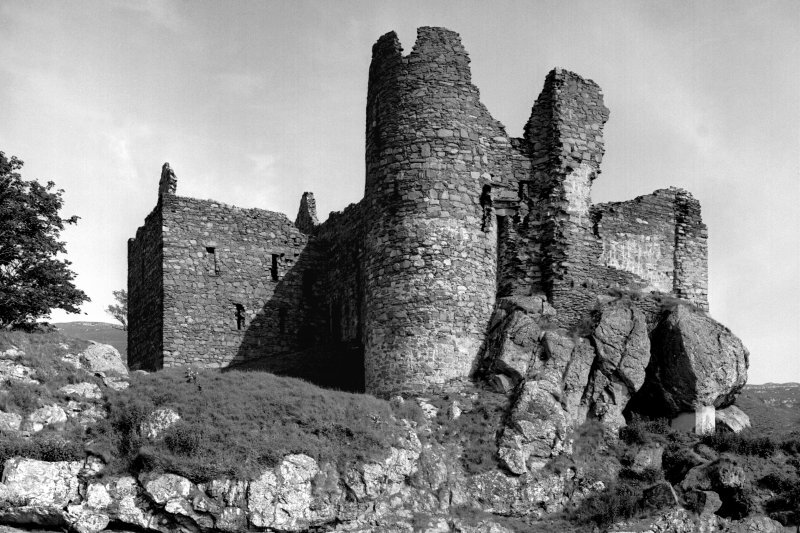 The castle was garrisoned in the1640s, but thereafter became ruinous. 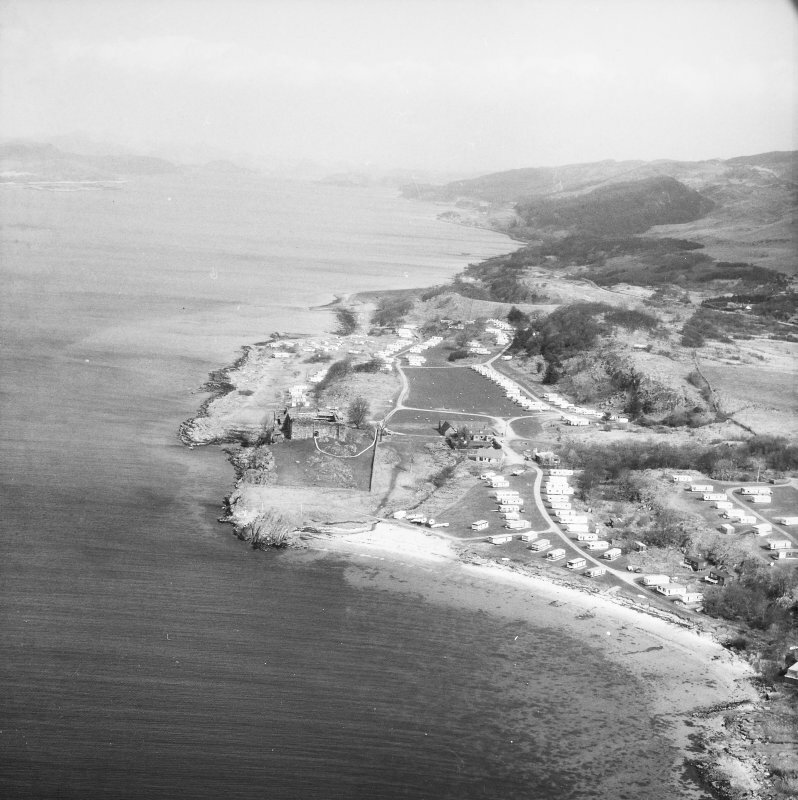 It was transferred to the guardianship of the Office of Works, now the Scottish Development Department, in 1933. 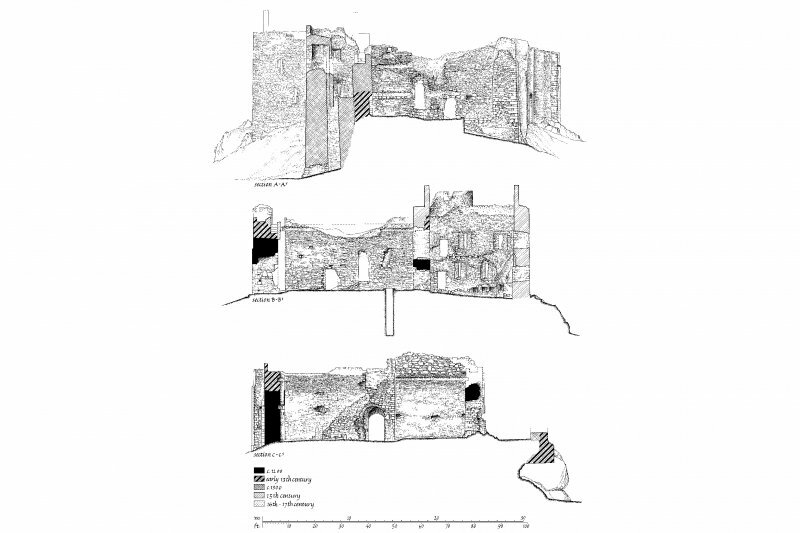 The present survey was carried out in advance of a major consolidation of the masonry in 1985-8, but has been revised to take account of information revealed by that work and by the excavation of part of the courtyard in 1989 (en.3*).